Salzburg is such a magical place to enjoy the Christmas season! Nestled among the mountains, a blanket of snow over the city, twinkling lights, festive decorations, and the smell of gluhwein and apple strudel float in the air. It is one of my favourite places to visit in December! 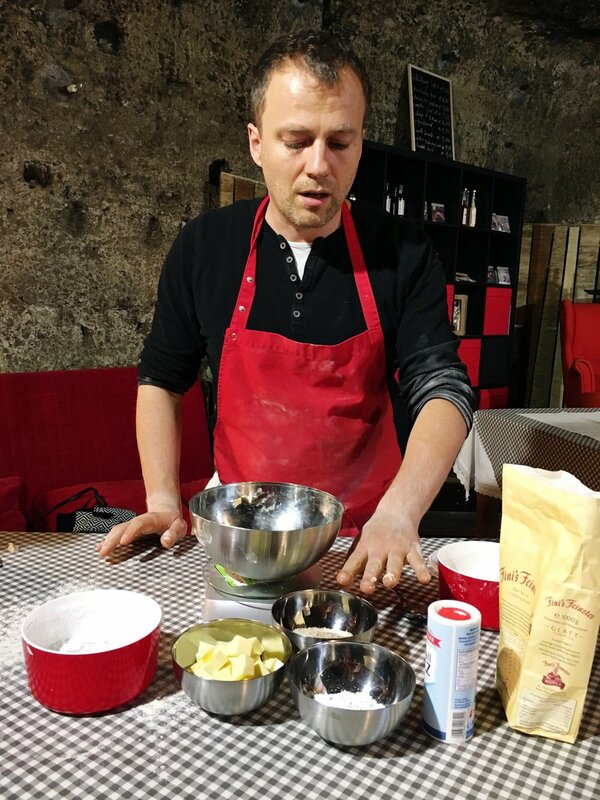 In addition to exploring the lovely Christmas markets, charming winding streets, fortress perched on the hilltop overlooking the city, and enjoying the Sound of Music tour, there is a unique and fun thing to do: Christmas baking! Having been to Salzburg a few times, I wanted to do something a little bit different during our trip. I brought my mum along with me, who is a baker herself. I came across the Edelweiss Cooking School, and signed up for the Apple Strudel and Salzburger Nockerl (christmas cookies) cooking lesson. 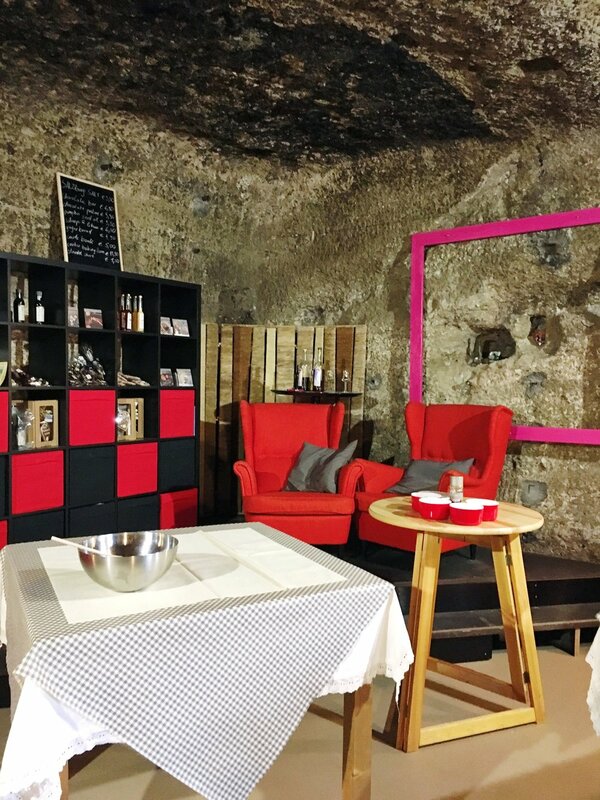 This cooking school is located inside a cave engraved in the Monchsberg mountain range. Only a ten minute walk from the Mirabell Gardens, it is a historical spot known as the Kaverne which served as the Tollgate to the Old Town, part of the Klausentor (city border) in the 18th century. It is beautifully converted inside, making it feel charming and rustic. It isn’t a large space, so the maximum size of a class is 15 people. All classes are taught in English. When we walked over for our lunchtime class, we found that we were the only ones signed up for the afternoon, so we got to have a private class! Johann is a wonderful and fun teacher, in addition to being an experienced chef. We had a great time with him during the afternoon. 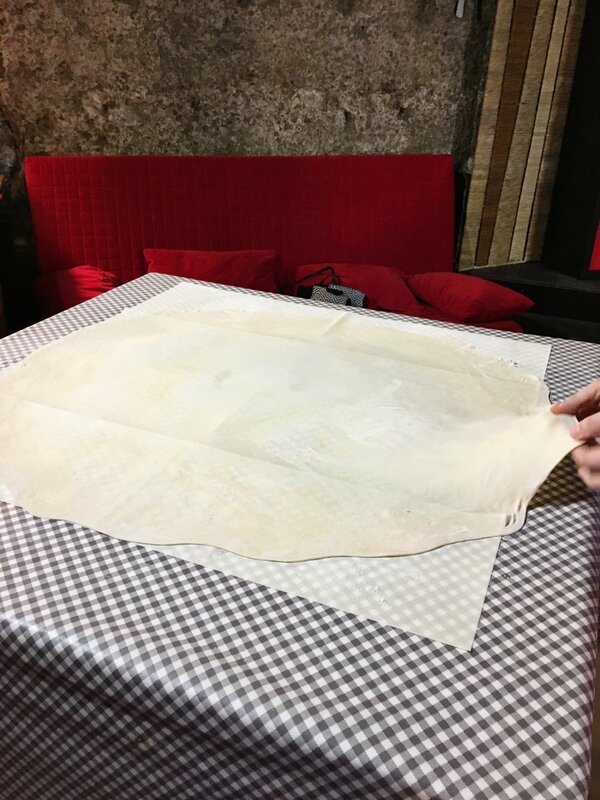 Johann worked with us to teach us how to make the strudel dough, stretch it out perfectly, create the filling, and put it all together. While the strudel started to bake, he taught us how to make the traditional ‘nockerl’ cookies. 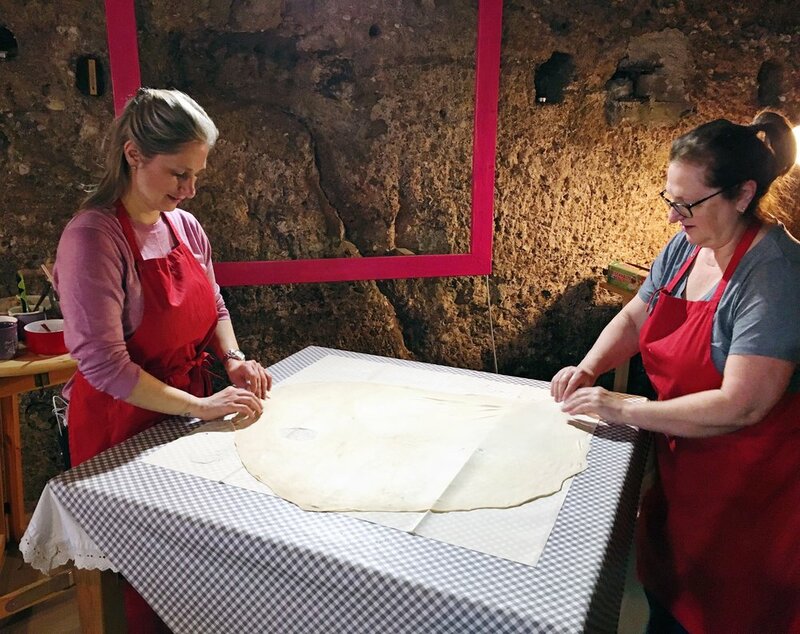 Learning to bake both treats was a wonderful way to also learn about the traditions in Salzburg, both their historic origins and how modern day Salzburg families use them now. While the strudel and cookies were baking away, Johann served us his homemade goulash soup, which was absolutely delicious! Ever attentive, Johann also took photos while my mum and I were baking, which are terrific memories of this fun afternoon! 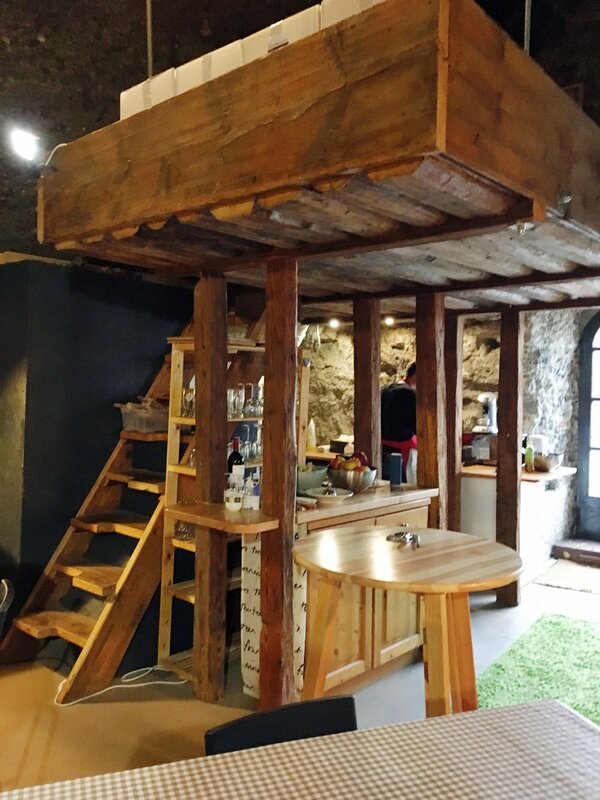 I highly recommend this cooking school if you are in Salzburg for something different and fun to do! There are a few different classes to enjoy throughout the year as well. If you’re interested in the Apple Strudel and Salzburger Nockerl class, it runs daily between 11:30am - 1:00pm or 2:00 - 3:30pm, and costs 44,90 Euros per person. Book in advance so you can secure at spot on their website! 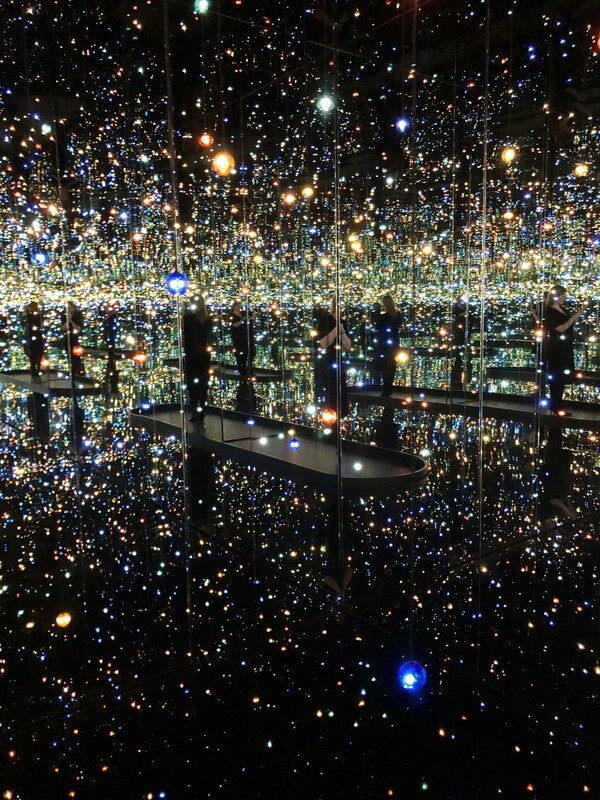 The Broad is a stunning contemporary art museum in downtown Los Angeles. The museum is home to more than 2,000 works of art, making one of the most prominent holdings of postwar and contemporary art in the world. 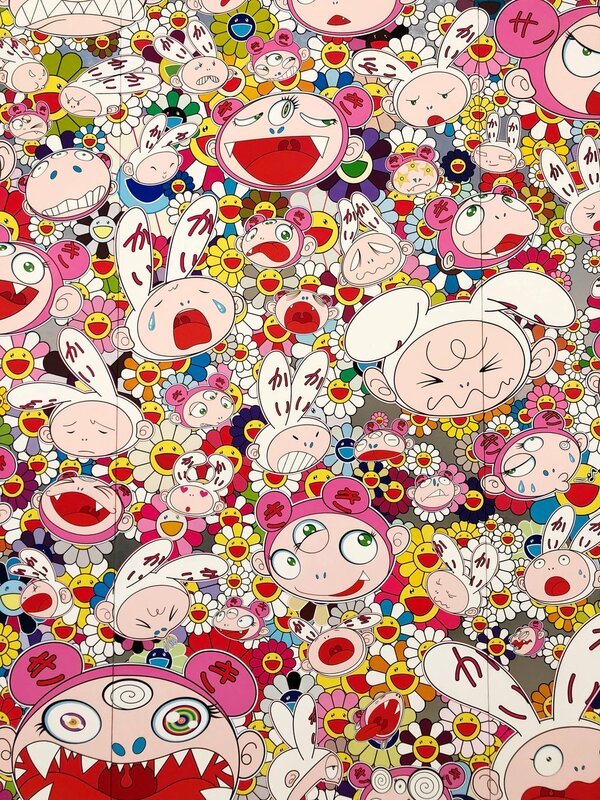 The collection features giants of the contemporary art world such as Jeff Koons, Jasper Johns, Jean-Michel Basquiat, Barbara Kruger, Kara Walker, Christopher Wool, Cindy Sherman and many more, including a growing collection of younger artists. 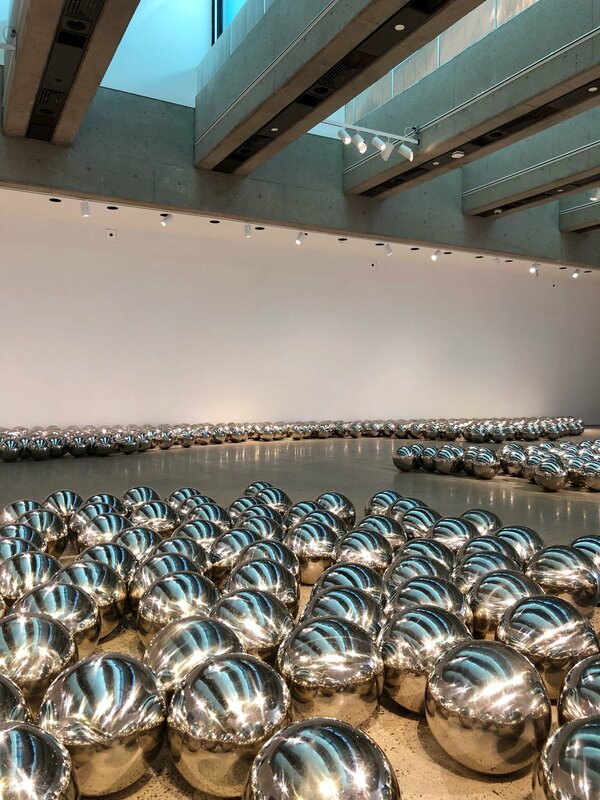 The Broad was founded by philanthropists Eli and Edythe Broad, who have been building their collection of postwar and contemporary art over the last five decades. There are two floors of gallery space spread over 120,000 square feet, and is the headquarters of The Broad Art Foundation's worldwide lending library which has been loaning collection works to museums globally since 1984. The museum also regularly hosts engaging temporary exhibitions. 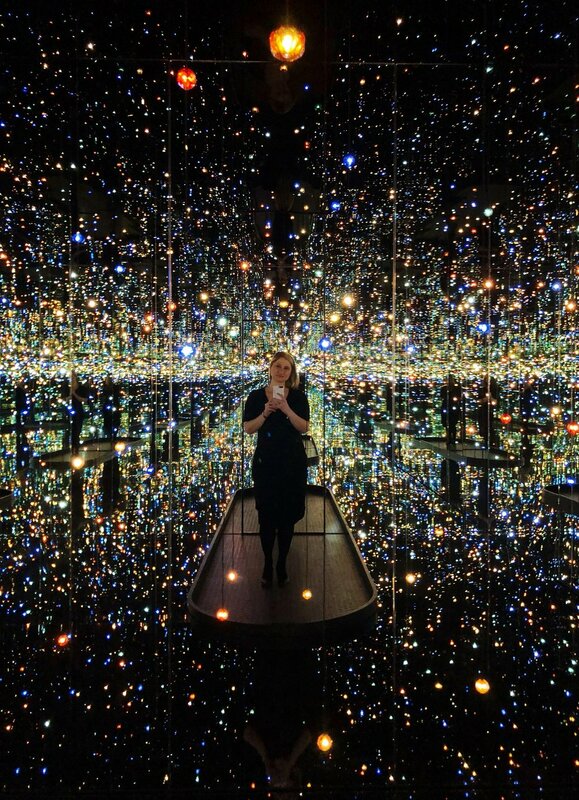 The Broad is free to visit, however you need to pre-book a ticket in order to secure entry due to its popularity. If you don't have tickets, there is an online standby line that you can join to get in on a first-come first-served basis. During holiday weekends, the wait time in the standby line can be up to two to three hours. There is so much to see and take in so try to allow yourself at least two hours to enjoy it. One of the cities I'd been wanting to check out for awhile was Zurich. This past October, I finally had the chance to visit! I had also been following the luxury boutique hotel, the Marktgasse Hotel, on Instagram, loving the regular dose of design inspiration from their stylish space. Once I booked my plane ticket to Zurich, I knew right away this is where I wanted to stay. 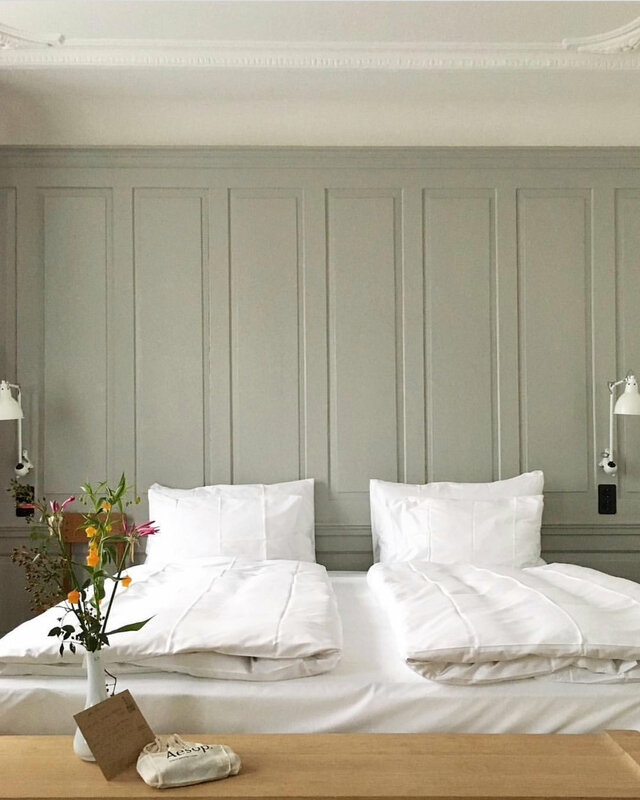 The Marktgasse Hotel is nestled in the heart of Zurich's Old Town. Situated on the corner of a cobblestone street in a beautiful small square, the hotel offers 39 individually designed and furnished rooms, two fantastic restaurants, and a bar. 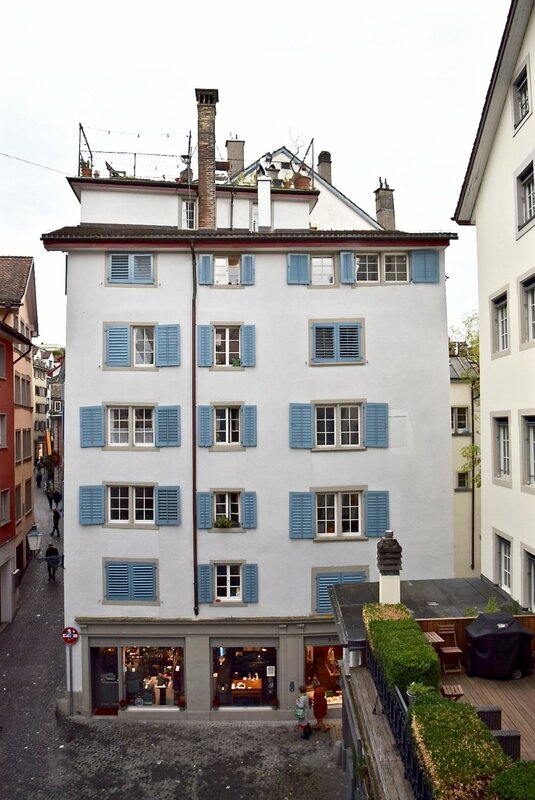 The building itself is one of the oldest inns in Zurich; the first written reference to the building dates back to 1291! 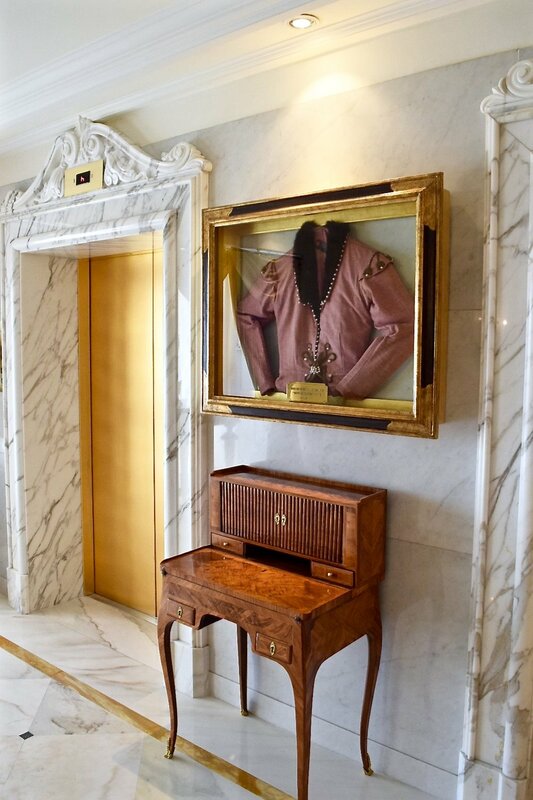 The building was recently carefully renovated between 2013 to 2015 adding quirky touches while preserving and incorporating its heritage into the design details. 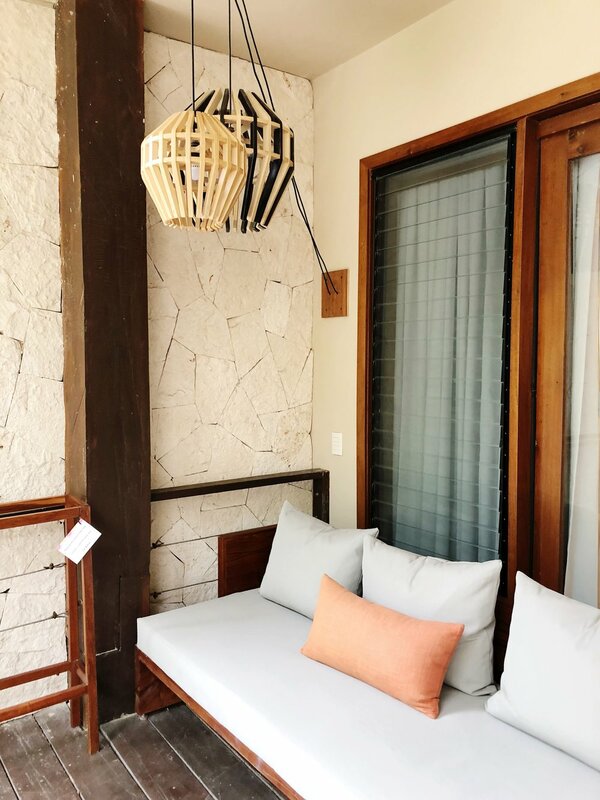 The interiors are contemporary, light, and bright with high ceilings, large windows, and white walls, with some eclectic design features injecting personality throughout the hotel. I love how unique, historical, and chic the Marktgasse Hotel is as its character and understated luxury made this a memorable stay. Many times during my stay, I didn't hear or see many other guests (even though they were there), so it felt very personal and cozy, almost like I had the hotel to myself! I also had fantastic service from the reception staff while checking in, which is always the sign of quality and makes a difference in kicking your stay off on the right foot. The hotel's location is fantastic as you can easily walk to many of the city's museums, galleries, and Lake Zurich, as well as being a short walk to the tram and main train station. Located between Bellevue and Central, you can check out sights such as the Kunsthaus (Museum of Modern Art), Schauspielhaus (Theatre), Opernhaus Zurich (Opera House), and Tonhalle (Orchestra), as well as the Swiss Federal Institute of Technology and University of Zurich. Just across the square from the hotel is the famous Cabaret Voltaire, the birthplace of the Dada movement. There are also many beautiful little shops, boutiques, and restaurants in the hotel's neighbourhood of Niederdorf. Delish and Baltho Restaurant are the two restaurants inside the hotel, both offering excellent food. As a guest, you can have breakfast at Delish on the ground floor of the hotel. I highly recommend their freshly baked, homemade cinnamon buns, which are popular with locals and guests alike, and their shakshuka. You can also have lunch there as they offer in-house smoked fish, regional cheeses, various salads, several types of bread, homemade granola, fresh fruit, and yogurt. They will also give you a takeaway container if you're heading out on a tour or going on a picnic. Don't forget to have a hot coffee by Henauer or tea by Schwarzenbach! I enjoyed a delicious dinner at the Baltho Restaurant on one of the evenings during my stay. The food and cocktails were absolutely divine. I had the Bang Bang chicken to start, a favourite on their menu, which was bursting with flavour. You can choose a smaller appetizer size of this tasty dish or a larger size as your main. Next, I had a fresh, handmade ravioli dish that was so tasty that I didn't want it to finish. For dessert, I had a local favourite of apple pie and ice cream - the perfect way to top it off. Attached to the restaurant is the cozy bar called Baltho Bar. Like the two restaurants, it is also popular with visitors and locals alike due to their inventive cocktails and extensive list of drinks - you'll want to sample them all! The Marktgasse Hotel has an inviting lobby featuring some fantastic design pieces, complimentary coffee, and fruit. There is also a cozy library where you can pick a book to read and adjoining salon for guests to enjoy, such as playing a board game. The library and salon can be hired out for business meetings, birthday parties, a reading event, or even a small concert. While the hotel doesn't have a gym on the premises, guests get free access to the Fitnesspark Hamam Münstergasse which is close to the hotel. Here, you can use the Fitness Area, Group Classes, and the Hamam (although treatments are not included). Each of the 39 rooms are individually furnished with high quality designer pieces and different layouts and floor plans from a small and cozy single room to the spacious Marktgasse Suite. All of the rooms has oak parquet or hard floors. 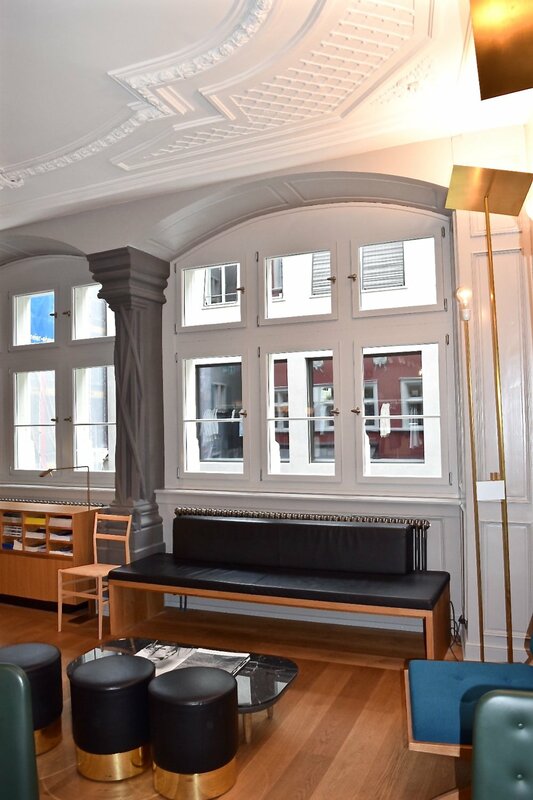 Due to the history of the building (one of the first inns in Zurich), some of the rooms feature heritage-protected details such as stucco, wall panelling, tiled stoves, and columns, as well as some slanted floors and lower ceilings in three of the rooms on the fourth floor. I slept well during my stay due to the cushy white bed linens and premium Schramm mattress. There is free wifi available as well as television with multiple international channels. The chic bathroom was stocked with Aesop products, one of my favourite brands! I had large windows in my bedroom and the bathroom, which was perfect to watch the world go by below and admire the district's beautiful coloured buildings and architecture. If you're planning a visit to Zurich, I would highly recommend this lovely hotel for a chic, modern, and comfortable stay with terrific service and amenities. Air: Flughafen (Zurich) Airport is the closest airport, and there are good transport links from the airport to the city. Train: There is a train from the airport that will take you to the main train station in Zurich (or trains from elsewhere around Switzerland or Europe, of course). From there, you can either walk to the hotel or take the tram. Tram: Take tram no. 4 or 15 to the Rathaus stop, and walk up Marktgasse, which will only take about a minute. You'll find the hotel on the left on the corner. Or, take bus no. 31 to the Neumarkt stop, walk down Neumarkt, continue on Rindermarkt for five minutes and turn left onto Marktgasse. Car: Much of the Old Town is blocked to personal vehicles, including Marktgasse. Public transportation is best to get here; however, if you're a guest with a valid reservation, you can drive up to the hotel to load and unload luggage. When I first moved to the UK in 2008, I discovered the phenomenon of Christmas Markets. I mean, being able to pop over to a new European country for a long weekend to explore a new city without high season tourist crowds, walk around in the frosty air amongst beautiful Christmas trees, twinkling lights, little market stalls selling all sorts of treasures, the smell of baked goods in the air, and sipping some hot gluhwein (mulled wine) to keep warm and festive - does it get any better? Well, perhaps, when snowflakes begin to fall around you adding to the magical atmosphere! Between exploring the Christmas markets in the city, you can duck into interesting museums, shops, and restaurants to explore and warm up. Since that first year I went in 2008 (to Prague), I have continued the tradition by visiting a new Christmas Market each year. Paris is magical any time of year you visit, but add some more lights and sparkle at Christmastime and it's almost overwhelming! I'm sharing my Paris Christmas Market trip guide and recommendations below. 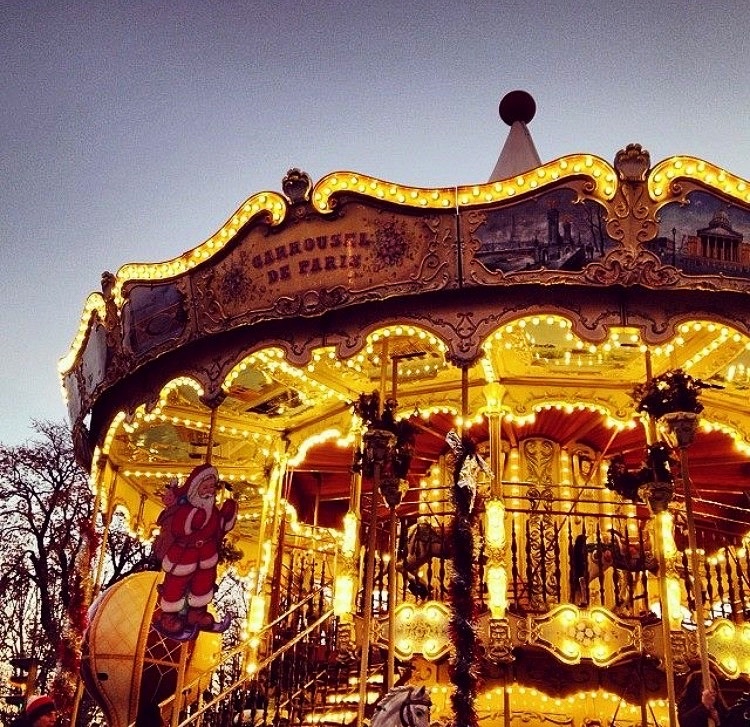 This is the largest Christmas Market in Paris with over 350 christmas stalls to explore, shop, and eat. It's in the business area of Paris, so while it isn't right in the centre of the city, it is a pretty quick Metro journey to get there. It is prettiest at dusk and into the evening when the lights switch on over the market and the surrounding buildings. Open: 23 November - 28 December, 2017; open every day from 11am to 8pm. 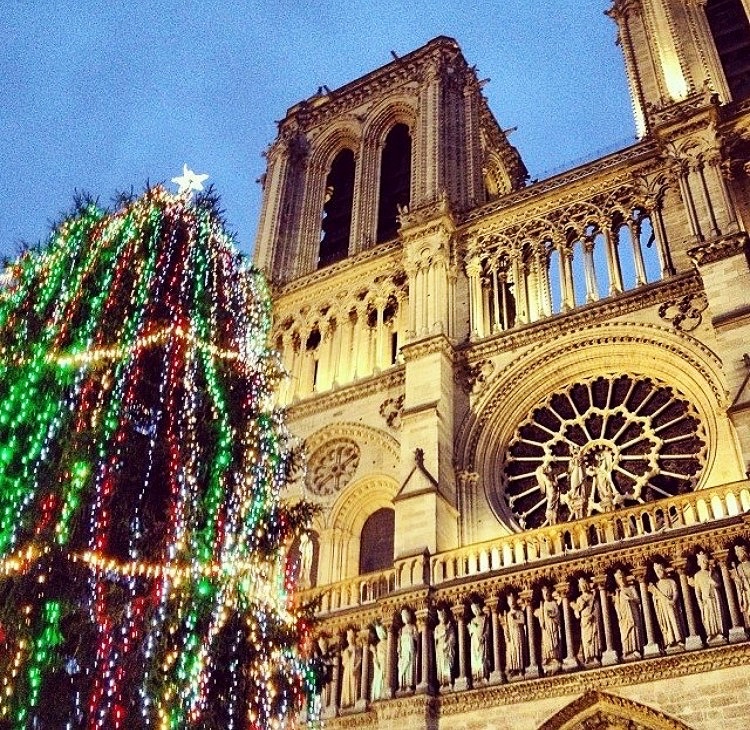 Notre Dame is one of Paris's most iconic and beautiful landmarks. 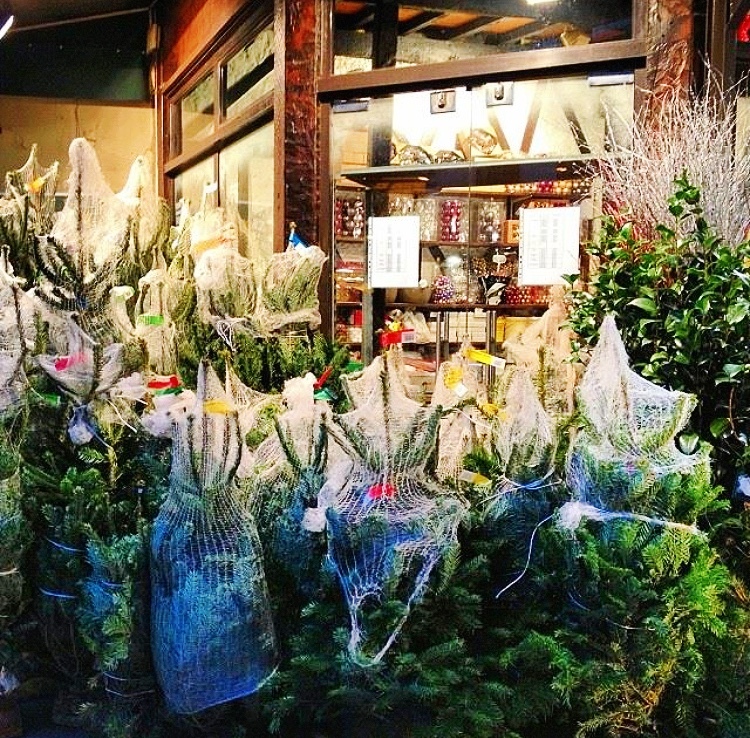 There is a lovely Christmas Market in Square Rene Viviani selling a host of French arts, crafts, and gastronomy. There are fewer market stalls here (about 40), but the setting and atmosphere are beautiful - and you can check out the Cathedral while you're there. Open: 15 - 24 December 2017; open every day from 10am to 8pm. This is one of my favourite areas in Paris. 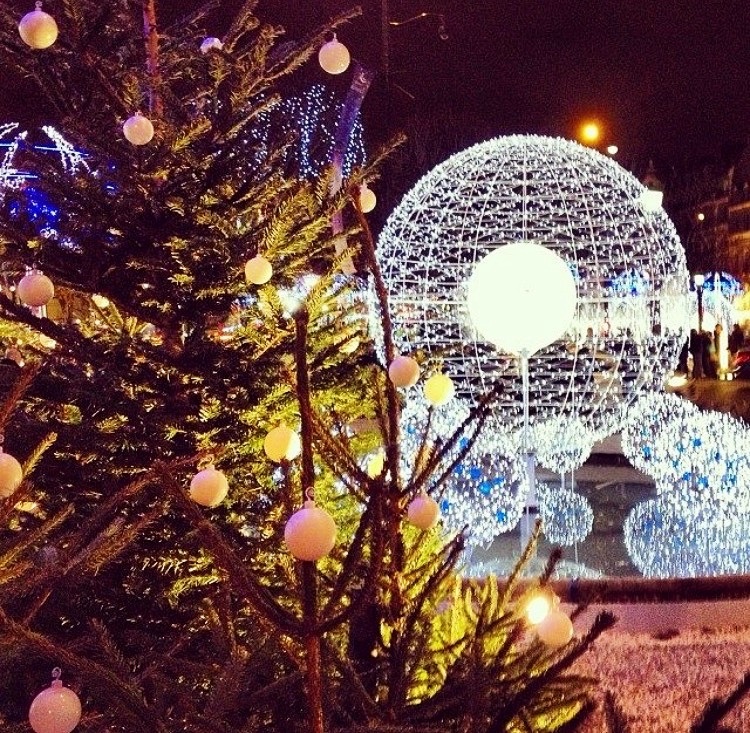 It features a lovely Christmas Market in front of the Abbey of Saint-Germain-des-Pres. After exploring the wooden chalets, enjoy a coffee outside at one of the bistro tables of Cafe de Flore or Les Deux Magots to people watch. There is great shopping and other great restaurants in this area too. Try checking out Le Bon Marche or stock up on French beauty products at City Pharma. 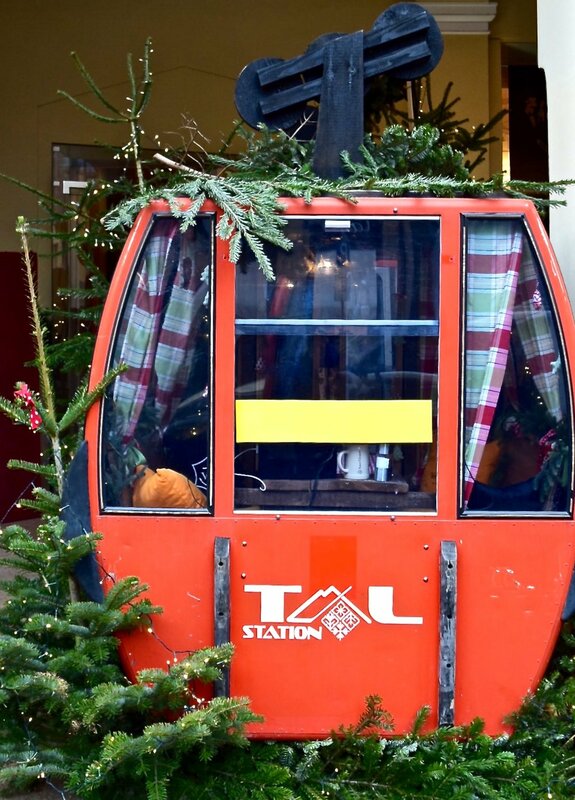 This small Christmas Market is in the lovely Place d'Italie, and features delicious food to enjoy as well as a selection of Christmas chalets selling festive items. 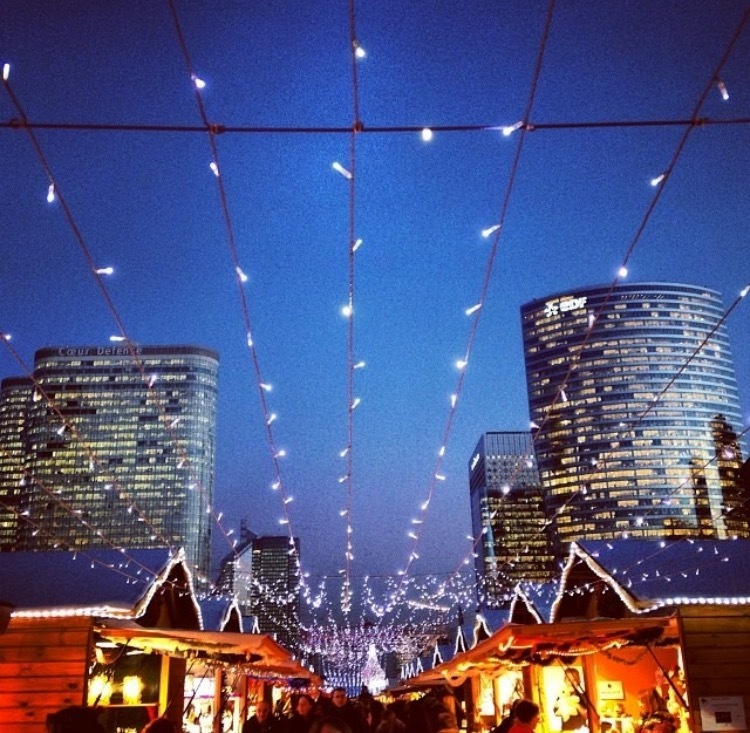 Close to the Eiffel Tower, there is another small market to enjoy shopping at and warming up with some mulled wine. While it's small, it makes up for it by its location - close to the Eiffel Tower (go in the evening to watch is sparkle) and the beautiful Bir Hakeim bridge (a double height bridge, made famous in Last Tango in Paris). Montmartre is the Paris often described in books: it has a dreamy Parisian village feel with its fairytale-like shops and homes dotting the hilly landscape and providing some of the most stunning views of the city. 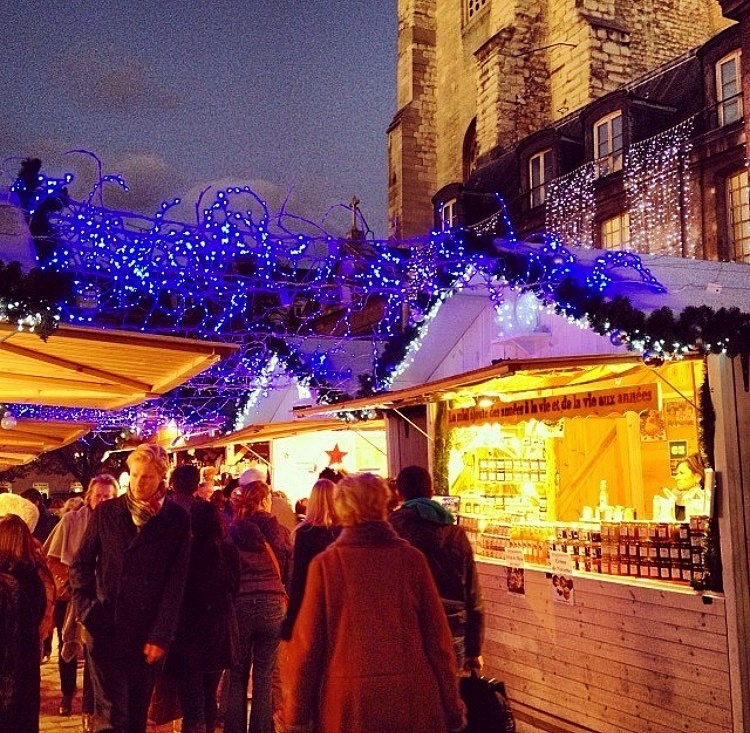 This market has about 30 christmas chalets selling mulled wine, French food, and traditional gifts below the Sacre-Coeur. 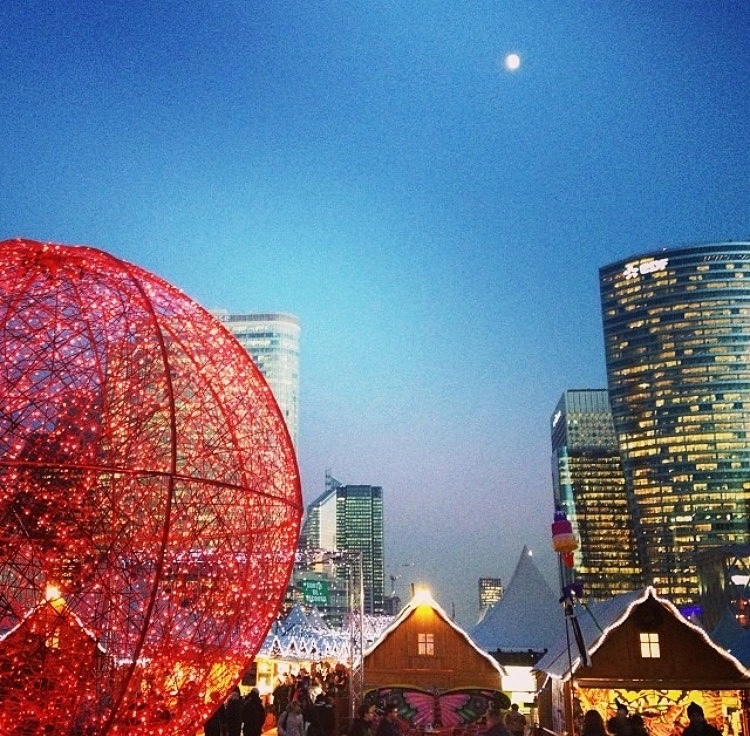 This Christmas Market is located at the Saint-Lazare station, and features a variety of pop-up shops selling unique items which are made in France. This elegant, famous boulevard is a cavalcade of lights and market stalls competing for your attention. There are over 200 wooden chalets stretching from the place de la Concorde to the Champs Elysee roundabout. To be honest, this isn't my favourite area for Christmas Markets in Paris as I found it to be too busy, too commercial, and very few unique things at inflated prices. If you're in the area, check it out, especially in the evening when all of the lights are on along the boulevard creating a beautiful sight. 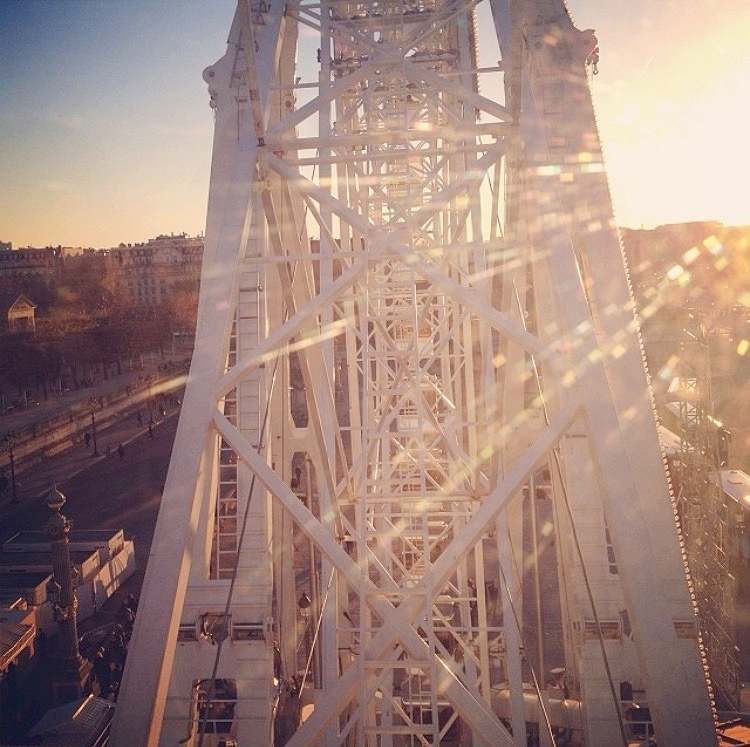 Another idea is to take a ride on the Wheel near sunset for stunning views with beautiful low winter light over the city. *Note: this Christmas Market has been cancelled by the Paris City Council due to its 'inferior quality food, toys, and trinkets'. It remains to be seen if this decision will be overturned! 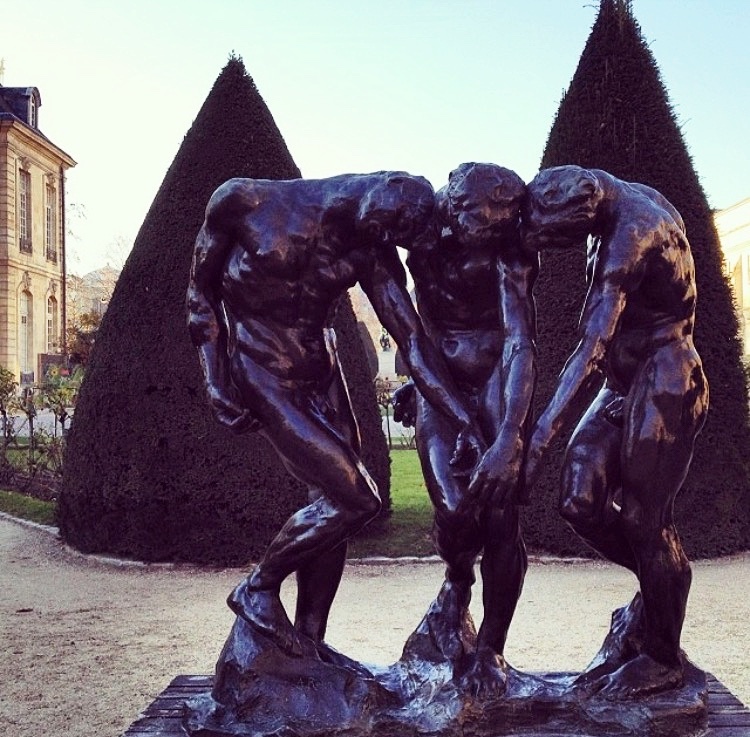 Musee Rodin: This small but beautiful museum is perfect to explore without feeling overwhelmed. 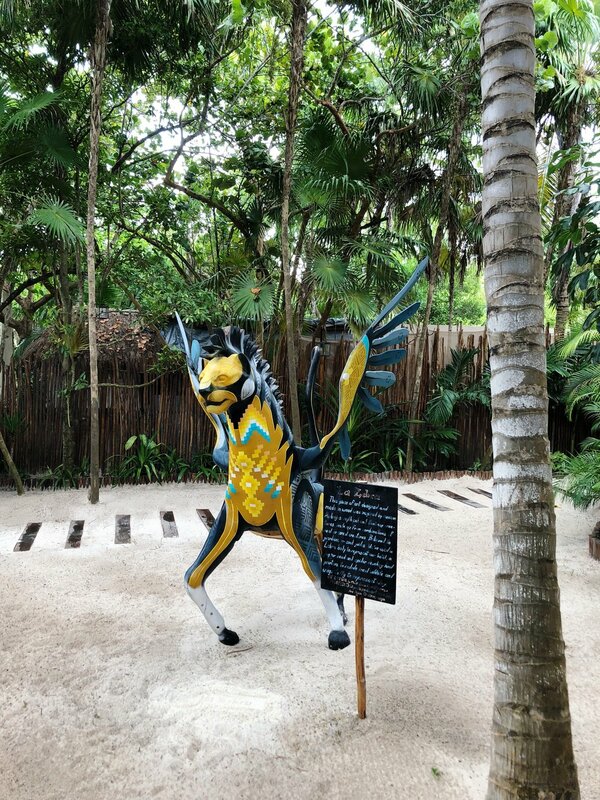 Many of the sculptures are in the beautiful gardens so you can walk around and explore outdoors, as well as inside the museum building. It also has a very nice cafe to stop for a small bite to eat or a coffee. Museum National d'Histoire Paleontology Section at the Jardin de Plantes, is very cool. They have lined up the skeletons of dozens (hundreds?) of animals progressing in size, so if you stand in front of it facing them, they look like they are running towards you! A small, but very cool museum inside a beautiful park. Louvre: Incredible but overwhelming. If you go, pick a few things in advance you really want to see and target those. This museum is absolutely enormous with thousands of things to see, and will tire you out quickly. Try and also buy a ticket in advance online to beat the crowds and queues. Definitely check out the grounds of the Louvre with its iconic Pyramid dominating the square. Grab a pastry and coffee from Claus and people-watch on one of the benches in the square. Musee d'Orsay: Another iconic Parisian museum to explore devoted to the arts between 1848 - 1914. Artistic movements featured include Realism, Impressionism, Symbolism, and Art Nouveau. Artists include Bonnard, Carpeaux, Cezanne, Degas, Guimard, Lalique, Manet, Monet, Pissarro, Renoir, Rodin and Van Gogh. There is a lovely cafe on the top floor of the museum to stop and rest your feet. While you're there, check out the large clock window for great views and photo opportunities. There is also a great terrace offering fabulous views over the city near the cafe. Musee National Picasso-Paris: This museum was recently renovated and features over 5,000 works of Picasso and tens of thousands of archived pieces. This collection, housed in a beautiful building, is the only one in the world that presents Picasso's complete painted, sculpted, engraved, and illustrated works, as well as a record through sketches, studies, drafts, notebooks, etchings, photographs, illustrated books, films and documents of his creative process. This is a fantastic museum to visit and not too overwhelming. It also has a very nice gift shop nearby. 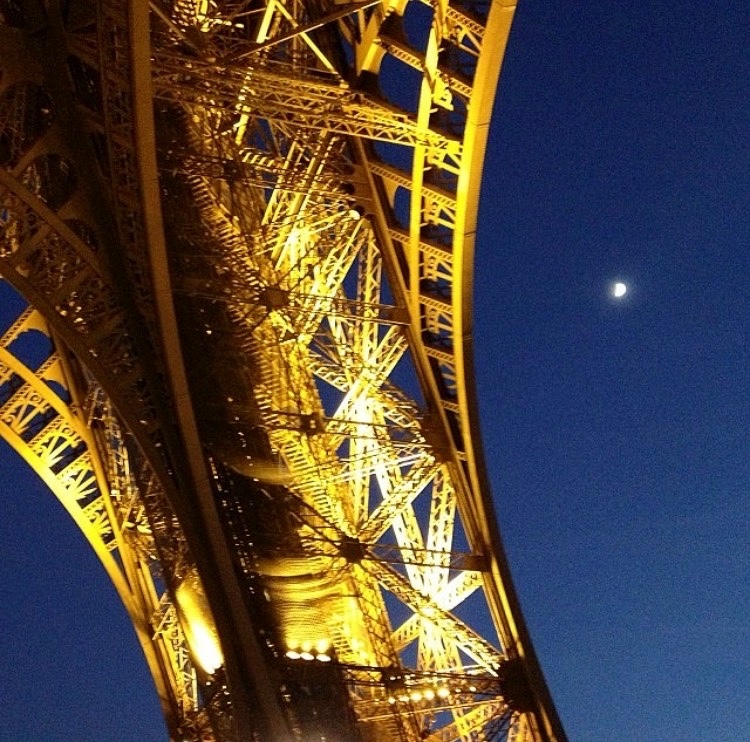 Eiffel Tower: For me, this is a must-visit every time I visit Paris. Yes, it's touristy but there's just something about it that draws me in, whether early in the morning when that magical Parisian daylight is rising, or in the evenings when the Tower sparkles and shimmers. My suggestion is to go to Trocadero first to admire it and take some fab photos, then walk down the steps and across the bridge so that you're at its base. under it. It sparkles on the hour every hour at dark (usually from 6pm) for about 5 minutes. There is a lovely park stretching out from the Tower as well, which is perfect for a picnic. Click here for more of my Eiffel Tower suggestions. Institut du Monde Arabe: This stunning building opened in 2012. The Institut features exhibitions and objects that show the diversity of the Arab world and Arab-Islamic civilization throughout history. 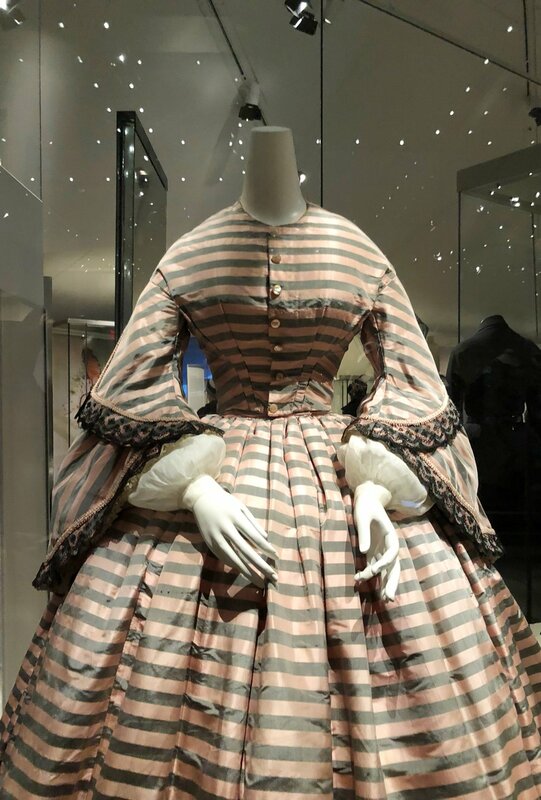 More than 560 unique works are displayed across four levels including bronzes, ceramics, woodwork, textiles, scientific objects, and illuminations. One of the most beautiful and fascinating elements of the building are it's windows, which features 240 photo-sensitive motor controlled apertures / shutters, which automatically open and close to control the amount of light and heat come into the building from the sun. This mechanism creates interior spaces with filtered light, which is an effect often used with climate-oriented strategies. I love going to the top of the building to enjoy the beautiful views over Paris from its rooftop terrace, and stopping at the rooftop cafe for a glass of champagne and delicious baklava. Musee de l'Orangerie: This beautiful museum is located in the Jardin des Tuileries. With many beautiful works of art to admire, the jewel in its crown is the spectacular room featuring Claude Monet's 'Waterlilies'. Worth the visit even if you just go to see this famous work of art! Notre-Dame Paris: This Parisian landmark is an iconic medieval Catholic cathedral located on the Ile de la Cite on the Seine. The cathedral is one of the largest and most famous religious buildings in the world, and considered to be one of the best examples of French Gothic architecture. You can climb up inside and enjoy stunning view of the city, as well as stroll the perfectly manicured gardens surrounding the Cathedral. Sacre-Coeur: The Basilica of the Sacré Cœur dominates the hill of Montmatre. It is a Roman Catholic church at the highest point in the city, providing visitors with incredible views over Paris. It is actually also a double monument as both a national penance for the defeat of France in the 1870 Franco-Prussian War and the social Paris Commune of 1871, which crowned its most rebellious neighbourhood, and an embodiment of conservative moral order. located at the summit of the hill of Montmartre, on the right bank of the Seine. Its dominating appearance on the hill in white with rounded towers make it seem almost fairytale-like. There are public 'steps' located out front that you can sit and enjoy the fantastic view and street performers. Annoyingly, there are some aggressive people selling cheap, knock-off items and trying to rip tourists off. Ignore them. Also ignore the tables selling lottery and games towards the bottom by being firm and confident. Palace of Versailles: It probably requires at least a half a day but is well worth a visit. The Palace of Versailles has been a World Heritage Site for 30 years. Once Louis XIII's old hunting pavilion was transformed by his son, Louis XIV, when he installed the Court and Government here in 1682. A succession of Kings continued to expand the Palace until the French Revolution in 1789 forced Louis XVI to leave Versailles for Paris. The Palace became the Museum of the History of France in 1837 with the rooms devoted to housing new collections of paintings and sculptures representing important figures and events that had marked the history of France. Today, the Palace has 2,300 rooms! The palace has extensive, beautifully landscaped gardens which spread over 800 hectares. One of the most spectacular rooms is the Hall of Mirrors, which was built to replace a large terrace which opened onto the garden. If you're a fan of Marie Antoinette, you'll enjoy seeing the chambers where she lived and slept! Palais Royal: Located close to the Louvre, this beautiful spot is popular for people to come for a walk around the beautiful gardens, strike a pose against the chic black and white columns, check out the contemporary fountains in the courtyard, or grab a coffee from the popular Cafe Kitsune. The Palais Royal was originally built for Cardinal Richelieu. The main part of the palace became a royal residence from 1661. It was completed and modified in the 18th and 19th centuries. During the 19th century, it became a place of promiscuity, which was immortalized by Balzac. 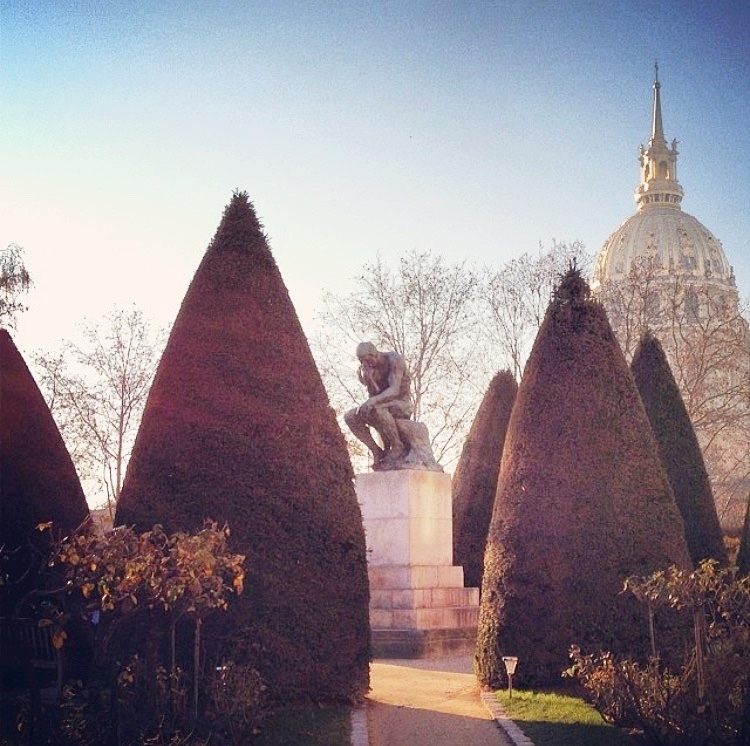 Gardens: Paris is known for its stunning gardens. Some of my favourites to explore are the Jardin du Luxembourg, Jardin des Plantes, and Jardin des Tuileries. Pere Lechaise cemetery: Located in the 20th, it is really fascinating and worth a visit (it isn't creepy). This is one of Paris's most famous and frequently visited cemeteries due to its extensive size (44 hectares and 70,000 burial plots), its landscaping (modeled after an English park), architecture and shrines including Gothic graves, Haussmanian burial chambers, and ancient mausoleums, and the numerous famous people who have been laid to rest here. Famous residents including Oscar Wilde, Edith Piaf, Camille Pissarro, Jim Morrison, Colette, Frederic Chopin, and Moliere, just to name a few. Fondation Louis Vuitton: Designed by renowned architect, Frank Gehry, the Fondation is an art museum and cultural centre which opened in 2014. The building itself is worth seeing, which is located in the Bois de Boulogne (near the Jardin d'Acclimatation). 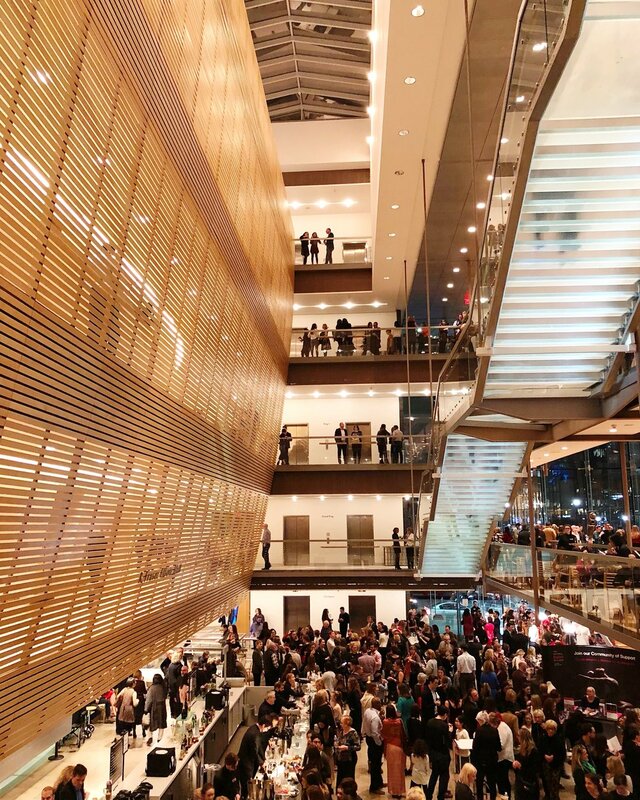 There are panoramic views throughout the building, due to its extensive and creative use of glass. It features a permanent art collection as well as special exhibits, and has a lovely cafe on the ground floor. Place des Vosges: One of Paris's oldest and most beautiful squares! Explore the arches housing shops, restaurants, and galleries which surround the main square and central garden. On the edge of the Marais, it is a perfect place to enjoy a picnic if it is nice outside. Arc de Triomphe: At the 'top' of the Champs Elysee and at the Place de l'Etoile, you can climb this famous arch and have beautiful views from the top across the entire city. Palais de Tokyo: This gallery is dedicated to modern and contemporary art, near the Trocadero. It also has a terrace with incredible views out to the Eiffel Tower that can be accessed for free. Le Bon Marche: I visit this beautiful store every time I'm in Paris. It's chic, filled with all kinds of fabulous brands (especially the beauty and women's contemporary sections) and items, and a seriously Instagrammable main hall with art deco escalators criss-crossing each other. They often feature creative art installations, so worth checking out to see what's on display. Galeries Lafayette: go here to check out the incredible main hall which always features a breathtaking Christmas tree! Some nice shopping for contemporary fashion and beauty, but I usually prefer Le Bon Marche. Printemps Hausmann: The showstopper here is their fantastic rooftop cafe for stunning views over Paris. Enter through the beauty counter entrance of the building and head to the rooftop via this route. The view is free, and it's lovely to sit with a coffee or glass of wine at the rooftop cafe, especially at sunset. Colette: Located on the swish Rue St Honore, this is a fashion favourite. 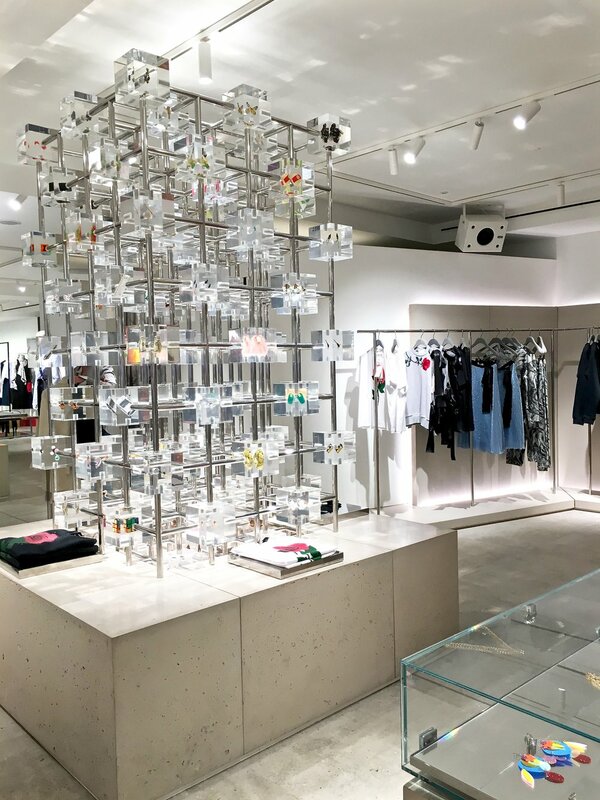 They always have cool features happening in-store as well as carefully curated, unique items and brands to check out. City Pharma: If you're as obsessed with beauty and skin products as me, you have to visit City Pharma in St Germain. This beauty cult favourite has all the best French products, like Caudalie, Avene, La Roche Posay etc etc, and all at inexpensive prices. Be warned though - it gets insanely busy so I suggest going early on a weekday morning or later in the evening on a weekday if you can. Stand your ground and ideally go with a list of things you want with you to stay focused. Merci: In the Haut-Marais is this fabulous fashion and home store. You'll probably know it by seeing the iconic Mini Cooper in the courtyard and its cool Used Book Cafe. Merci acts as a launching pad for young designers to make themselves known to French and international shoppers. Shakespeare and Co: This brilliant and famous independent bookshop sells a wide selection of English language books on the left bank. It was the first bookshop to publish James Joyce's Ulysses in full. It regularly hosts events, including hosting some of the most famous literary figures in history such as Ernest Hemingway, F Scott Fitzgerald, Jack Kerouac, and Allen Ginsberg. The shop was forced to close in 1941 when Nazis occupied Paris. It also has a little cafe attached to it next door. It is definitely worth checking out! Fish La Boissonnerie: Located in Saint-Germain-des-Pres, this restaurant has a regularly changing menu featuring fresh, seasonal ingredients and dishes. Their wine selection is also terrific. I have never had a bad meal here. 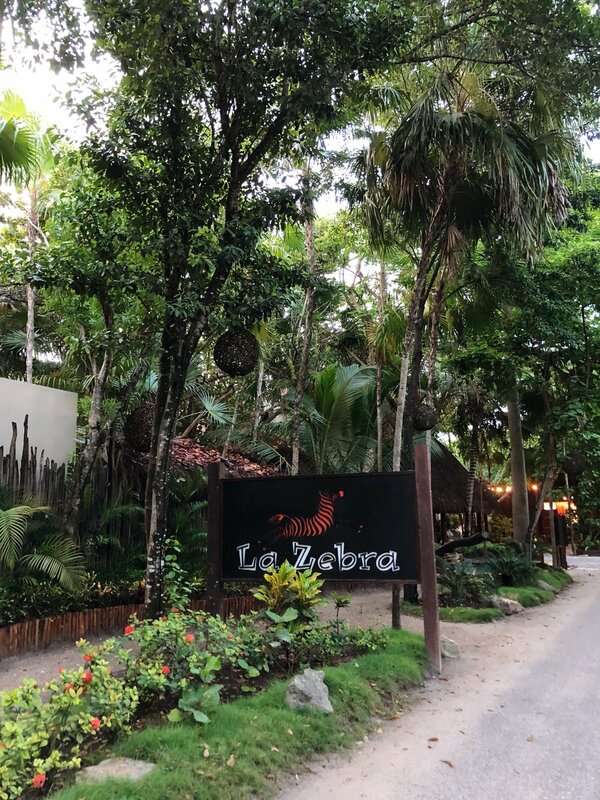 Make a reservation for this small restaurant to secure your chance of having dinner here, or slide up to eat at the bar to enjoy and chat with the people around you. A must visit on any trip to Paris I make! Semilla: This restaurant is by the same owners of Fish La Boissonnerie and is also a wonderful, slightly more upscale restaurant just across the road. 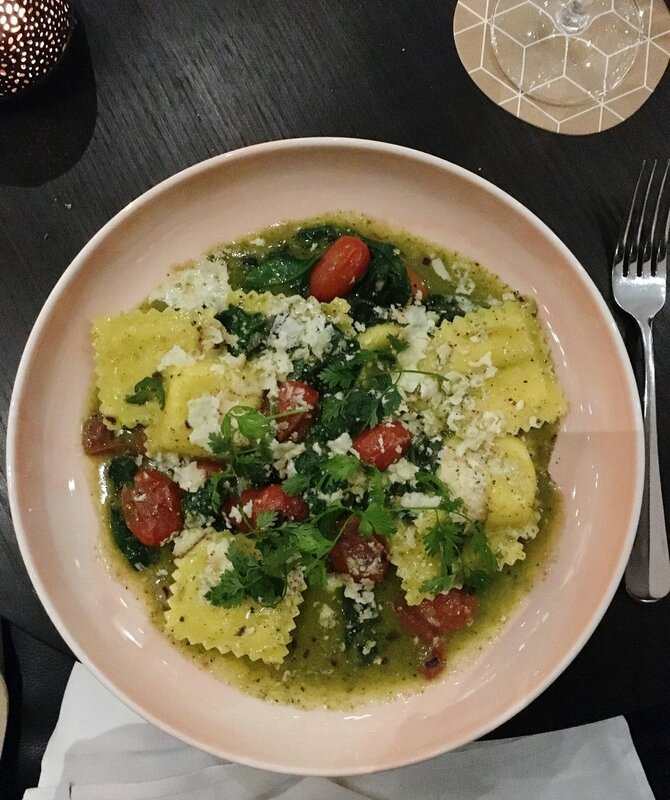 Semilla features very tasty dishes with fresh, seasonal ingredients on its regularly changing menu. Le Mary Celeste: This is easily one of the coolest places in Paris. This tiny restaurant and bar is located in the Marais and features creative, delicious dishes on a regularly updated menu. This place is buzzing with people so reservations are recommended. 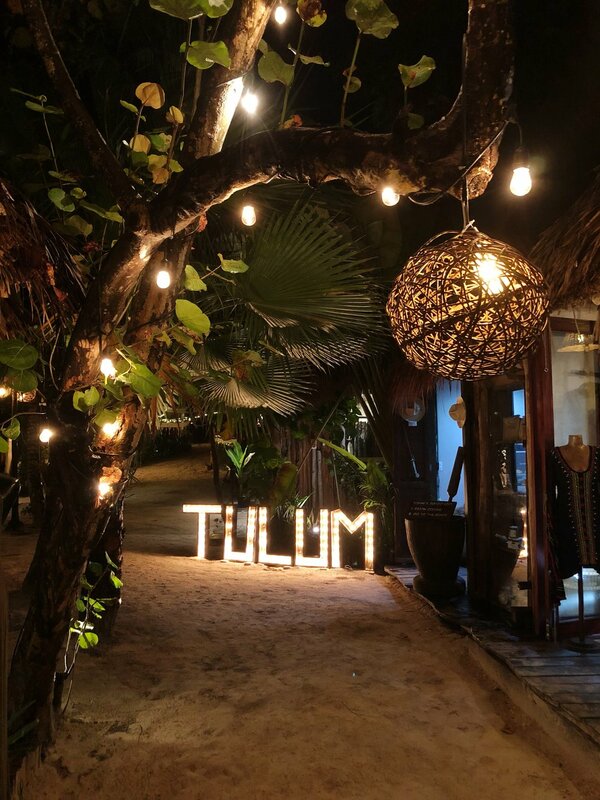 It's a great place to go with friends to share a variety of dishes, or try some of their amazing cocktails (some of the best I've ever tried anywhere!). L'Éclair de Genie: The best eclairs anywhere, hands down. The incredible eclairs by master pastry chef Christophe Adam literally brought tears to my eyes when I first tried them - they are THAT good! There are a few locations in Paris now, but my favourite is the one in the Marais. If the Salted Caramel eclair is available, definitely make that your first one! 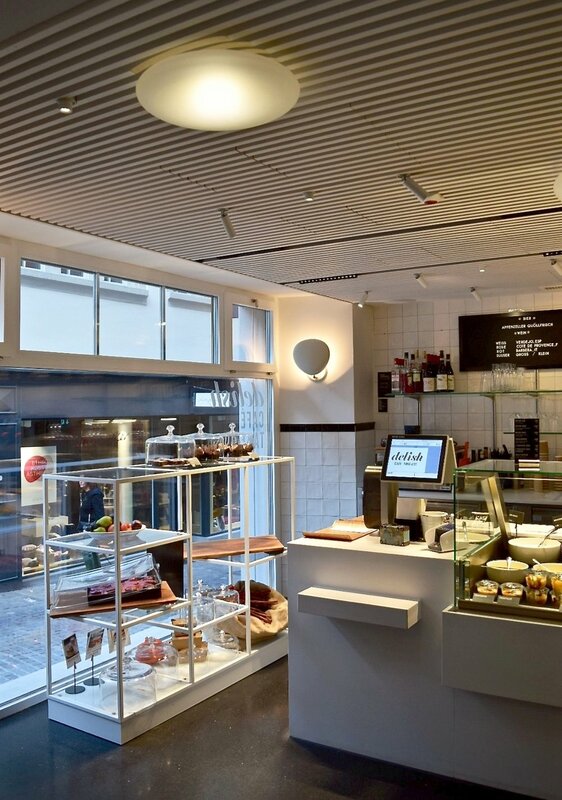 Rose Bakery: This is a great place for brunch, particularly at their Marais location, or take a shopping break and have a coffee and their famous carrot cake if you're at their Le Bon Marche location. Don't go too late in the day though or you'll miss the carrot cake and some of the other in-demand cakes! Bistrot Paul Bert: Classic French food in a beautiful bistro style restaurant. The food was incredible and the desserts were out of this world. We ordered a cheese board, which arrived at our table on a giant cutting board - with full size blocks of cheese and a knife to cut the amount you wanted! One of my friends ordered the baba au rhum (Rum Baba cake), which came with an entire bottle of rum to top up at your pleasure! I had their Paris Brest, which was to die for. Grande Mosquee de Paris: Enjoy a fabulous mint tea and baklava in the lovely courtyard and gardens, and explore one of the biggest mosques in France. Printemps Haussmann: If you're looking for a great quick lunch or snack, the gourmet food hall at Printemps is incredible! This is a food hall Parisian style - think champagne and oyster bars, fancy tapas, gorgeous pastries, and more. The last time I was there, I enjoyed some sparkling wine and tapas. Lovely! Mama Shelter: Not just a fabulous place to stay, it is also a great place for cocktails at night and where cool Parisians hang out. Mariage Freres: This French tea company is my favourite brand of tea (particularly Vanille des Iles and French Breakfast). They have a few locations around Paris, and some of them do a wonderful afternoon tea. Ralph's Paris: This lovely little cafe by Ralph Lauren is in Saint-Germain-des-Pres inside a beautiful courtyard. It is a nice experience if you want something a bit lux. Claus: A lovely brunch and coffee spot in the Marais, close to the Louvre. It's always busy so I've usually just grabbed some of their lovely to-go pastries and a coffee and eaten them on one of the benches outside of the Louvre while people-watching. Au Petit Versailles: One of the best bakeries in Paris in the Marais. It's tiny but wonderful, and regularly wins awards for their bread. Their croissants are wonderful for breakfast, and don't forget to try their Paris Brest (located at 1 Rue Tiron)! Cafe Kitsune: Fantastic coffee in the beautiful Palais Royal. Daroco Paris: Daroco is in the building of what used to be Jean-Paul Gaultier's first store, and leaves much of the original footprint in place. New, chic additions have been added, such as an open kitchen, opulent velour banquet booths, and mirrored ceilings. The pizzas here are out-of-this-world delicious! Make a booking as this restaurant is proving to be one of Paris's most popular. Mama Shelter: Located in the 20th arrondisement, this Philippe Starck designed hotel is one of Paris's coolest places to stay. While it isn't in the centre of Paris, it is easy to get around to due its proximity to the Metro. It is one of the most diverse, interesting areas of Paris, as well as being close to the Pere Lachaise cemetery. there are 172 rooms which are equipped with 5 star bedding and fun interiors. The restaurants are all delicious, from simple, homemade cuisine. You can check the huge island bar, pizzeria, or terrace. There is also a lovely rooftop to enjoy during warm days for a drink or meal. Grand Hotel du Palais Royal: I absolutely adore this beautiful small luxury boutique hotel in the heart of the Palais Royal. Incredibly friendly staff are there to help you have a comfortable staff, the rooms are impeccably decorated, and the location can't be beat. Check out a more detailed review of this hotel when I had the opportunity to stay there here. Le Meridien Etoile: This hotel is located very close to the Champs Elysee near the Arc du Triomphe end. It has small and stylish rooms, and is well located to travel around the city with a Metro station very close by. Check out more details and full details on my stay here. Staying at an Airbnb is a wonderful option, particularly if you are staying in Paris for longer than a weekend, and/or want to feel like / pretend you live in the city. Below are two Airbnbs that I have stayed in that I really enjoyed! Le Marais - rue Vieille du Temple: Large (especially in Paris terms), stylish, and a super location in the Marais. Saint-Germain-des-Près: Tiny, but in lovely building in an unbeatable location in Saint-Germain-des-Pres. Paris has a great Metro system. Buy a set of 'carnets' (tickets) so you can pass through the stations easily without having to buy a new ticket each time. While you're in the stations or on the Metro though, be sure to watch your pockets and belongings very carefully, particularly when it is busy, as there are very skillful pickpockets that work the system. Walking around Paris is one of the most wonderful things. Overall, Paris is a pretty small city. I suggest picking a neighbourhood and just start to wander. Literally, just pick a neighbourhood and wander. My favourites are St Germain, Marais, the Latin Quarter and Montmatre. If you can take the Eurostar to Paris, I highly recommend it! 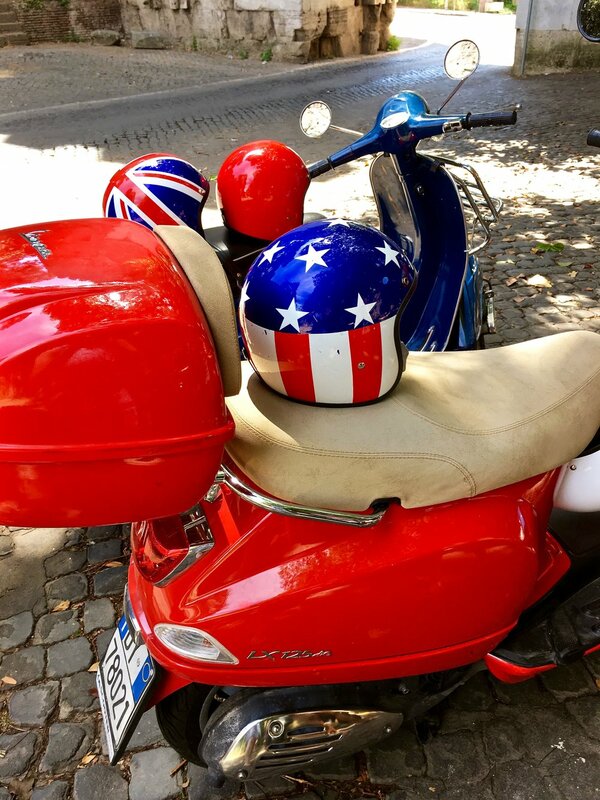 It is such an easy, quick, and chic way to travel. From London, it takes just over two hours from St Pancras International Station to the centre of Paris at the Gare du Nord station. Paris is well served by two main airports: Paris Charles de Gaulle and Paris Orly. Both are well connected into the centre of the city by transit links. Have you been to the Design Museum in its new home in Kensington? It's now housed in an incredible new building where the architecture is just as interesting to admire as the exhibits! 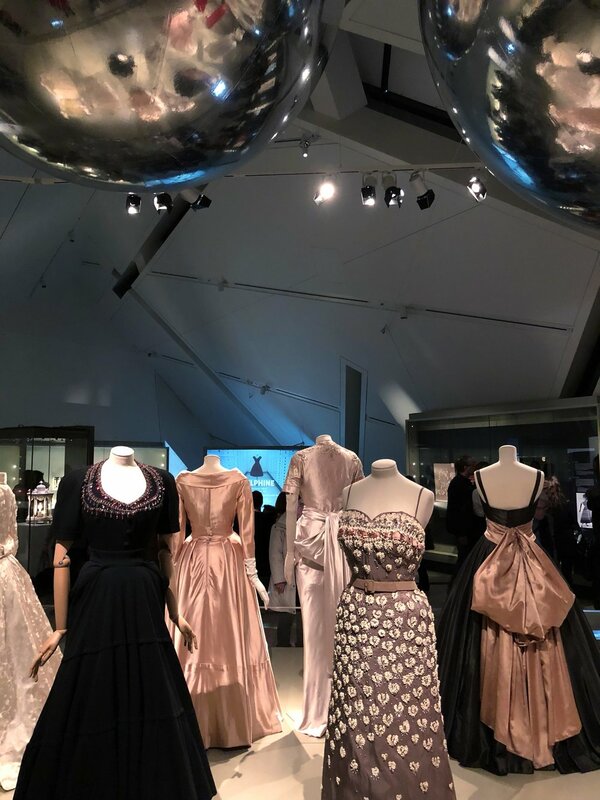 This museum is focused on design in multiple forms including graphics, products, fashion, architecture, and industrial design. It is considered to be one of the world's leading museums dedicated to contemporary design in multiple forms. The new Design Museum has much more space, and can host more talks and events in its new 200 seat auditorium. It also features its first permanent exhibit called 'Designer Maker User'. 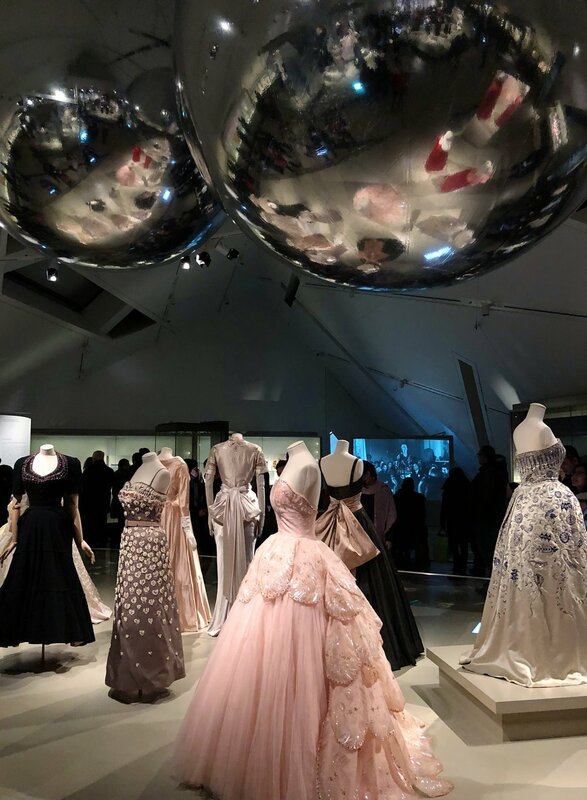 This fascinating exhibit takes you through nearly a century of modern design through these three roles, featuring nearly 1,000 pieces of twentieth and twenty-first century design from fashion, graphics/art, architecture, engineering, and technology/digital. The museum also hosts a series of temporary exhibits, so check their website and Instagram account to stay up to date with the latest happenings. 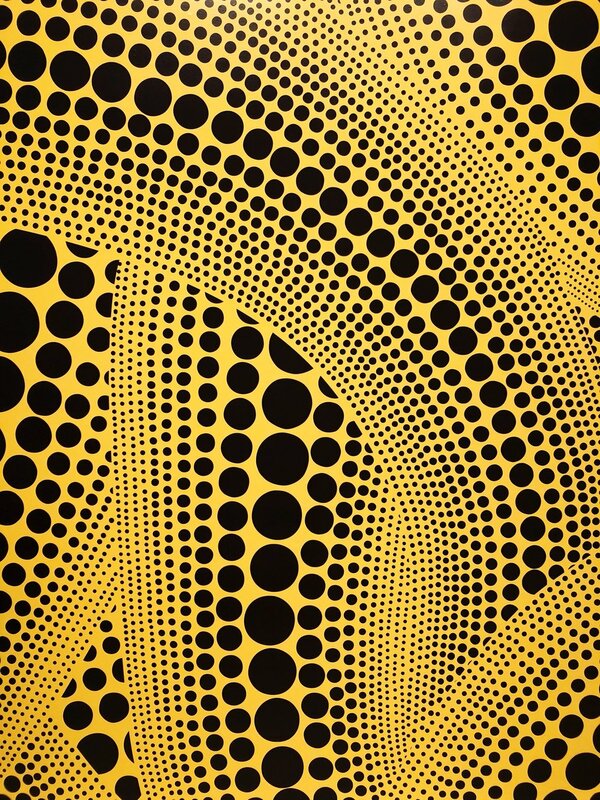 The Design Museum is open daily between 10:00 - 18:00. It is also open late on the first Friday of each month until 20:00. It is free to check out the permanent exhibits, but expect a charge for tickets for temporary exhibits. I can also recommend the fantastic gift shop as well as they are filled with all kinds of chic and modern items (and great if looking for a unique gift)! In December, I went to Munich as part of my annual visit to explore a new European Christmas Market. While I was there, I had the opportunity to spend part of my stay at the wonderful Hotel Vier Jahreszeiten Kempinski Munich. It's located in the heart of Munich on the grand Maximilianstrasse, just a few blocks away from key sites, such as Marienplatz, Munich's most famous beer hall, the Hofbrauhaus, the State Opera House, and fabulous shopping. This hotel is also steeped in history, having been built in 1858 originally for King Maximilian II. From the moment you arrive at the Kempinski, you are warmly greeted by sharply-dressed doormen who whisk your bags away to your room for you once you have checked in so they are waiting for you. The Kempinski has transformed the entrance of the hotel into an apres-ski scene, where you can enjoy a cozy glass of mulled wine, hot chocolate, and some warming food inside traditional ski lift cabins! There is also a bar set up in the centre of the ski-lift cabins with tables to stand at and enjoy some warming drinks with friends. It is such a great idea and helped add to the festive atmosphere. When you enter the grand lobby, your breath will be taken away by the stunning art nouveau style glass ceiling, creating a warm and cozy glow over the room which is also a popular Munich bar. In this case, as it was Christmas, a large floor-to-ceiling tree stands covered with sparkling Swarovski ornaments. Great service also greets you by the reception staff, who make checking-in (and out) a breeze, and warmly welcome you for your stay. Back to the main lobby, you can enjoy tea, coffee, cocktails, a meal, afternoon, or a tasty snack here. In fact, you can enjoy over 30 different teas, with Joel Belouet helping you make your choice, who is a certified 'Tea Master Gold'. You can also enjoy a traditional British afternoon tea with fresh classic sandwiches, pastries and scones. If you just fancy something sweet, there are many options to make your mouth water having been carefully made by the Kempinski Munich's expert patissier, Ian Baker, who also holds the honour of being Patissier of the Year 2015! 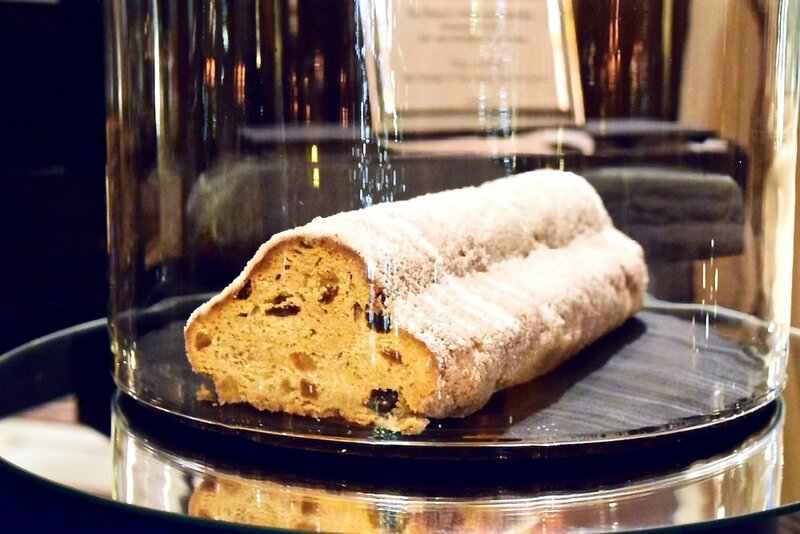 Having enjoyed a few of the cakes, including the delicious stollen bread, I can highly recommend indulging. There are 300 rooms available, which include 67 suites. Each room is uniquely decorated, inspired by the period of Maximilian II. Although each room is a bit different, there are common features, including a mixture of traditional and modern materials and techniques using glass, lumber, marble, and mosaics. 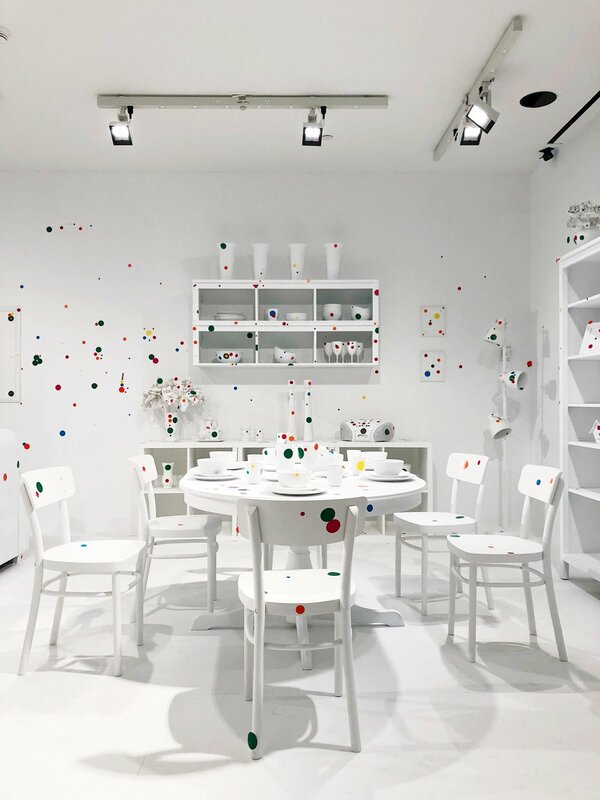 The plexi-glass chairs in the rooms were designed by one of my favourite designers, Philippe Starck. The moment I walked into my room, I felt instantly at home (and wasn't just because of the lovely welcome bottle of red wine and pastries!). The room exudes the mix of modern and traditional glamour perfectly, making you feel this is true luxury comfort. One of my favourite features in the room (both the main bedroom, and the bathroom which was a surprise!) were the replica paintings from the Old Pinkothek in Munich so you can enjoy your own Rubens or van Dyck in the comfort of your room. Essentially, the paintings were photographed and then wallpapered to effectively recreate these masterpieces. These re-created pieces of art made up for the fact that my view unfortunately was not very good. I also loved the use of plush fabrics and linens around the bed. 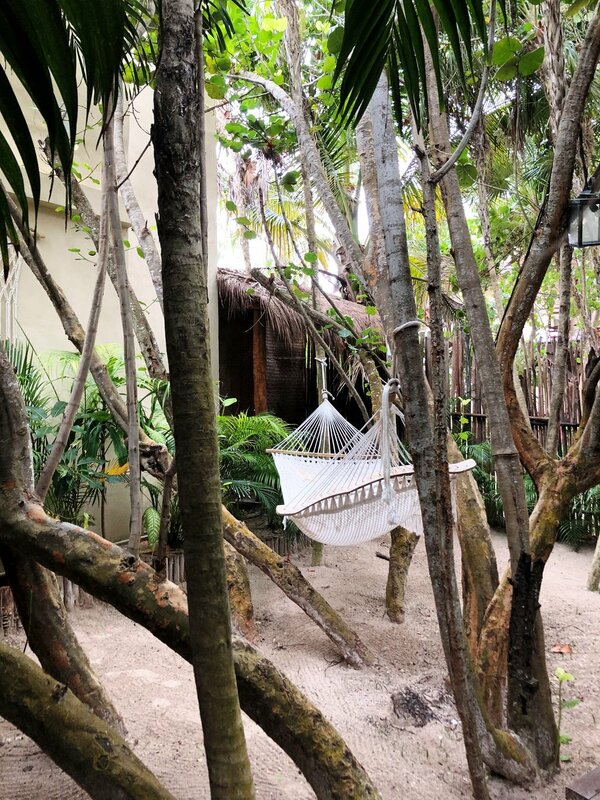 There is nothing better than an inviting bed to sink into after a long day of exploring. The bed has a suede headboard, which also extends onto the ceiling. The white linens are high quality, helping make your sleep extra sweet. Another great touch is the custom white cabinetry. Stylish and functional, it makes you feel like you're in a 'real' bedroom, and has plenty of space to unpack and tuck everything away. The bathroom was another favourite feature due to the unique decor and high tech features. Though, I think I loved the cuddly robe and soft slippers even more! Make sure that you wake up in time to properly enjoy the delicious breakfasts at the hotel. What I loved is that the buffet is served in a room that recreates a beautiful home kitchen, adding to that luxury comfort feel. The food is fresh, tasty, and a wide selection to choose from - including the chance to enjoy a glass of sparkling wine. The staff are friendly and will help arrange anything you need. My Sunday in Munich brought lots of rain and wind - and an unawareness that pretty much most of the shops and sights in the city are closed! What to do? Enjoy the luxurious spa on the top floor of the Kempinski, of course! I was definitely not alone in this idea, with quite a few others enjoying the lounge chairs around the pool with cups of tea and magazines, having a swim, or enjoying a treatment or two. I chose to have a reflexology treatment with Tyson, having walked for miles and miles over the previous few days exploring. It was incredibly relaxing and I hated that it had to stop at the end of the hour. Whether you are staying at the hotel or not, try a treatment here (and ask for Tyson!). There are a range of services to choose from, including massages, facials, manicures, pedicures, or body treatments. If you feel so inclined, there is also a fitness centre to keep up with your fitness schedule while you're away. The Hotel Vier Jahreszeiten Kempinski Munich has a 24 hour concierge to help you with your every need, including 24 hour room service. There are also laundry and cleaning services, a hairdresser, boutique, Bulgari shop, and flower shop. You can also have a limo arranged to get to the hotel from the airport when you book your room. Or, if you have driven, there is a car park underground. I truly loved my stay from the moment I arrived to the moment I had to drag myself away to return home to London. For me, the glamour and luxury struck the right note. It wasn't over the top and puts a focus on comfort in quality surroundings, service, and privacy. It is also an an ideal location to base yourself to explore the city, saving travelling time. You truly feel like you're staying somewhere special. If you're thinking about visiting Munich, don't hesitate to have the Kempinski at the top of your list to stay! I first discovered the Grand Hotel du Palais Royal after walking through the Palais Royal a couple of years ago. 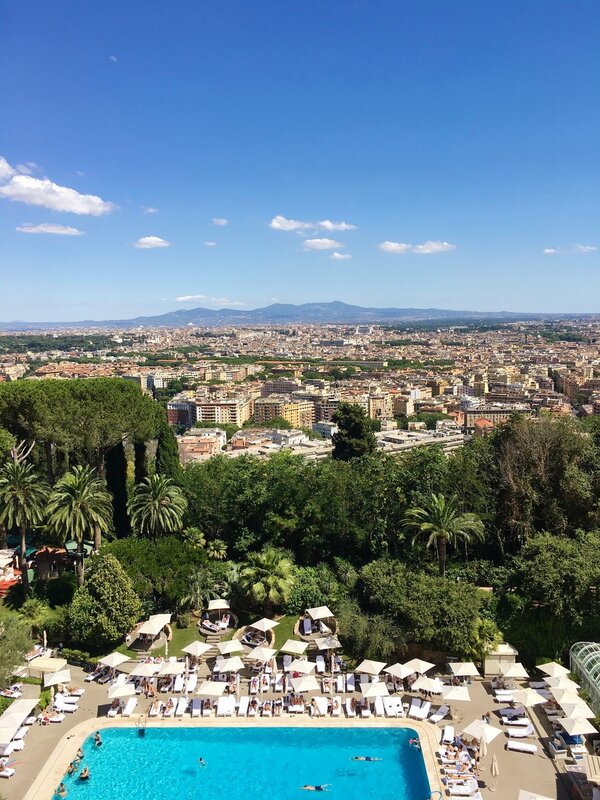 I looked it up on Instagram to find that they had a beautiful account that I began to follow, enjoying the regular dose of inspiration from the hotel and its surrounding areas. The Grand Hotel du Palais Royal is a small luxury, five star boutique hotel, just a stone’s throw from the Louvre and across the road from the stunning Palais Royal. With interiors designed by by Pierre-Yves Rochon, the hotel is chic and elegant, wrapping you in private luxury from the hustle and bustle outside. It is also part of an 18th century building with aspects of it holding a historical designation, including the facade. Some of the 68 rooms and suites in the hotel have their own balcony with stunning views of Paris and famous landmarks, including the Eiffel Tower and Sacre Coeur. 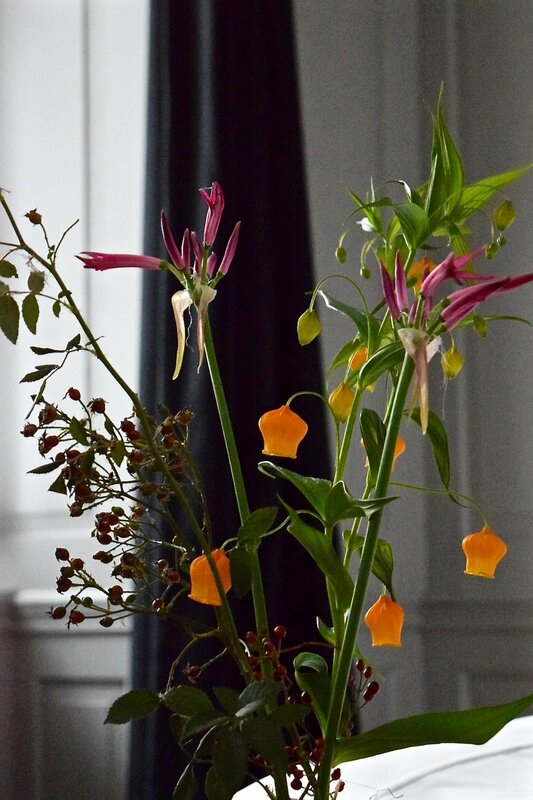 Throughout the hotel, fresh flowers and plants greet you as a nod to the stunning Palais Royal gardens on its doorstep. You can also indulge your senses at the Le Lulli Restaurant, Lounge Bar, and Carita Spa. I recently stayed at this beautiful hotel, feeling like royalty from the moment I arrived. An attentive doorman was waiting to open the door to my taxi, sheltering me from the downpour of rain with an umbrella overhead and whisked me inside. Inside, I received a warm welcome from Concierge, who checked me in quickly while also explaining all the amenities and services available. I then had a bellboy guide me to my suite. I stayed in the Palais Royal Suite, which took my breath away as soon as the door opened. When you step inside, you are greeted by a plush chaise lounge and small terrace overlooking the courtyard, and a staircase (!) leading up to the rest of the suite. As I walked upstairs, I took in the warm and welcoming bedroom, chic, modern bathroom made of glass and marble, and inviting living room with a walk-out terrace. I actually felt happy that it was stormy outside so that I could change into the cozy bathrobe and relax in my mini palace in the heart of Paris, watching the Eiffel Tower sparkle on the hour. The suite is on the 7th floor and has private access. The view from the living room looks out to the Opera Garnier and Sacre Coeur Basilica, as well as looking over the Palais Royal and street below where you can watch the world go by. The jaw-dropping bathroom is all glass, light and marble, with a double sink, deep bathtub with a lovely window view, and separate shower stall. Those who follow me know that high quality toiletries are always a sign of a great hotel, so I was very happy to see that luxurious Atelier Cologne products were provided, as well as the extra thoughtful touches including vanity and dental kits. Make a cup of coffee with your own Nespresso machine and walk out to your private terrace, where you can gaze out to the Eiffel Tower and Louvre. After enjoying a delicious buffet breakfast in the hotel's restaurant, Le Lulli, take a stroll into the Palais Royal with its chic black and white-striped podiums and perfectly manicured gardens to enjoy a coffee at one of Paris’s most popular coffee shops, Café Kitsune. 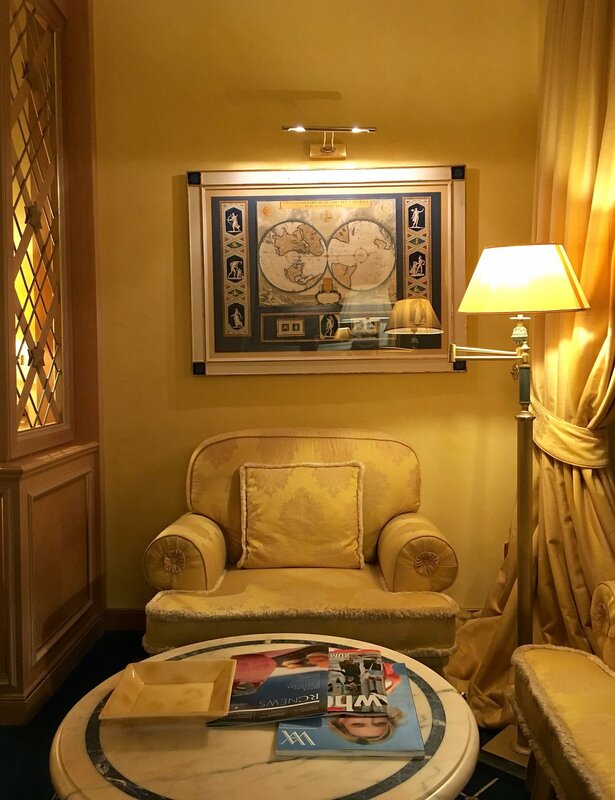 After a day of exploring Paris, pop into the hotel's cozy Lounge Bar for some tea and pastries. Or, enjoy a masterfully mixed cocktail or tasty bite to eat, open from 11am to 11pm. If you're feeling fancy, enjoy the Champagne Bar, where you can choose from over 30 different selections. 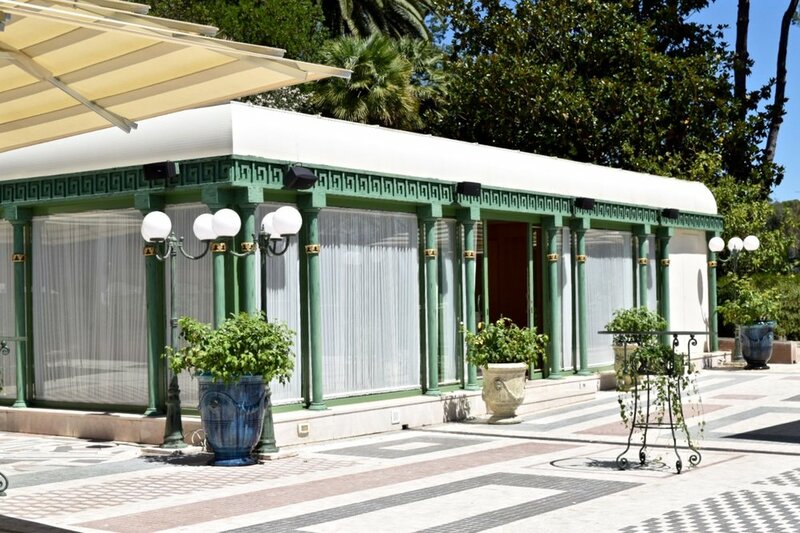 At the Le Lulli Restaurant, which is housed inside a winter garden flooded with light, enjoy exquisite French cuisine by Executive Chef Clement Le Norcy, trained by Michelin Star Head Chefs Francois Adamski and Michel Portos. Le Norcy works with quality, seasonal, regional, and organic products in his creations. For reservations, contact lelulli@ghparis.com or +33 142 96 72 20. I enjoyed a wonderful hour-long massage at the Carita Spa. Part of the personalized luxury touch was the fact that service can be upon request until late in the evening. After arriving on a Friday evening during a storm after a long week, I rang the Concierge who arranged a massage for later in the evening, which was divine. The Spa features a large Turkish bath, two treatment rooms, a beauty salon (including hairdressing and nail services), and wide menu of services, as well as a fitness room with state-of-the-art exercise equipment and personal training. You can also purchase Carita products and Kure Bazaar nail polish on site. You can also enjoy the services of the Spa if you aren't a guest at the hotel; however, access to the fitness centre and hammam is reserved for the guests of the Carita Spa and Hotel. The Spa is open daily from 9am to 10pm. A unique offer by the hotel is to enjoy an exclusive tour of the Palais Royal and learn about its history, including it being the former palace of Cardinal Richelieu (originally built in 1639) and how it became the most important market in Europe in the 18th century. The tour lasts between 1.5 to 2 hours with tea included at the hotel lounge. The price per person is 130 € per person (2 persons minimum, 55 € per additional person). Additional services offered by the hotel include 24 hour room service, daily turndown service with complimentary water, laundry and dry cleaning services, highly trained 'Clefs d'or' concierge, a business centre, valet services, and complimentary wifi. Multiple languages are spoken by staff including French, English, Spanish, Portuguese, and Russian. The Concierge can also help you with everything from booking restaurant reservations to theatre tickets to key sights and attractions in Paris - nothing is too much trouble! The hotel is easy to find. If arriving by plane, it takes about 45 minutes from Charles de Gaulle Airport, and 30-45 minutes from Orly Airport. If you arrive via the Eurostar, the hotel can be reached in about 15 - 20 minutes by taxi from the Gard du Nord or by Metro (lines 1 and 7; Palais Royal - Musee de Louvre). From Gare de Lyon, it is about a 10 - 15 minute taxi ride. You can also take the bus via lines 21, 48, 69, 72, or 81. There is also a Velib bike station about 50 metres from the hotel. The hotel also offers private transfers, which can be arranged with the concierge team prior to, and during, your arrival. Need some more Paris inspiration? 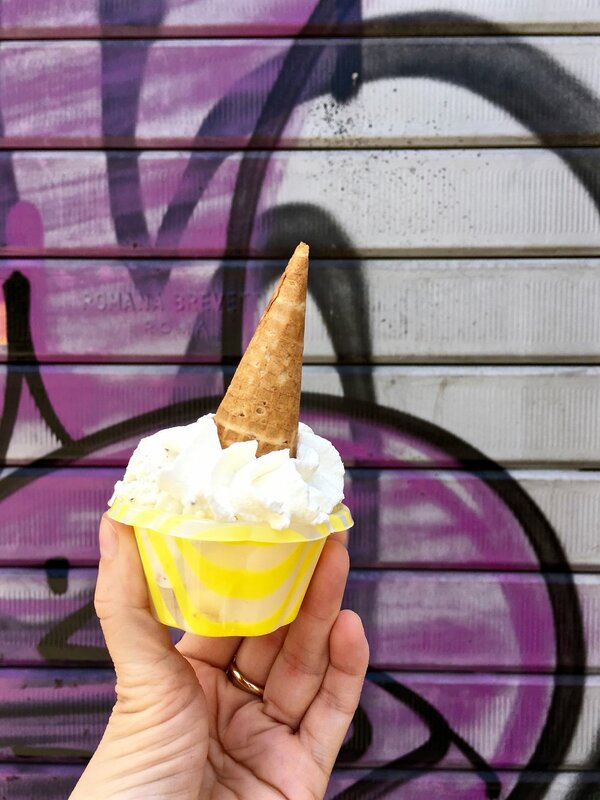 Check out some of my favourite things to do in Paris here! In making my annual Christmas Market visit to a new European city, I stayed at the lovely Hotel München Palace in Munich for part of my stay. This family run, five star boutique hotel is located in the beautiful, upscale Bogenhausen quarter of the city. The hotel is owned by the famous Bavarian restaurateur family Kuffler. 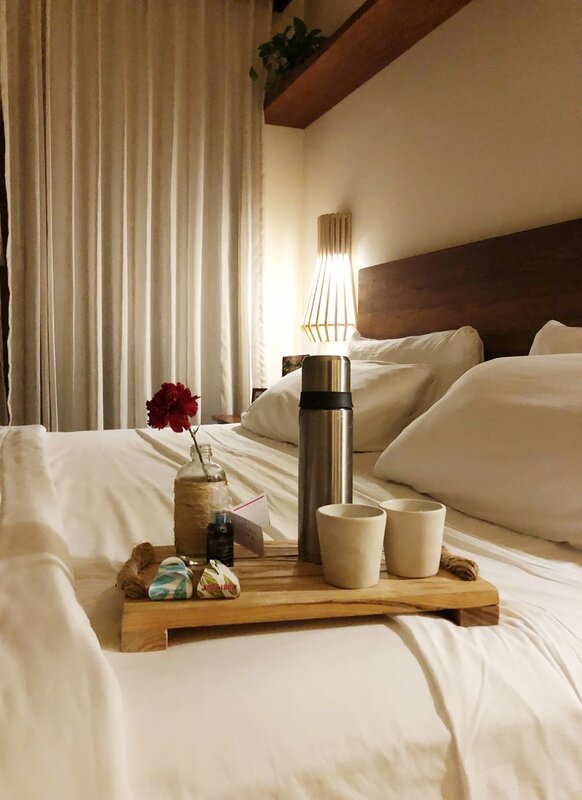 This hotel provides a personal touch that focuses on making sure that its guests have a comfortable, warm stay in an exclusive, elegant, and private environment. Walking into this hotel for the first time, I was warmly greeted by a sharply dressed doorman and friendly reception staff. The small but warm and inviting contemporary lobby was festively decorated with a large Christmas tree twinkling in the corner with cozy armchairs and sofas to relax in. My first impression of the hotel was that it felt like a well-kept secret in Munich, an exclusive hotel to enjoy in privacy and peace. A boutique hotel, the Hotel München Palace has 74 rooms all individually decorated in an elegant, modern style by Kuffler Inn Design. You can choose from a classic single room through to one of the suites in the hotel, including the large and luxurious Presidential Suite for the ultimate in comfort. 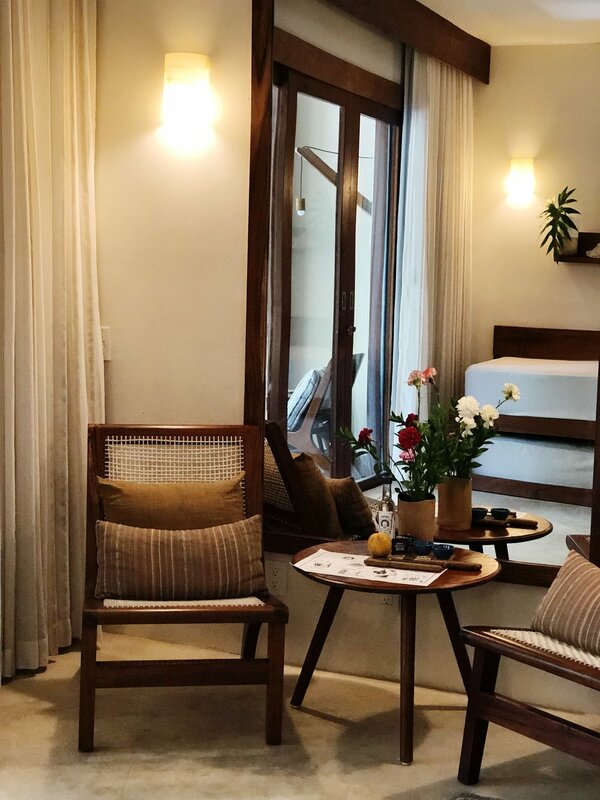 All of the rooms have parquet flooring, a minibar, safe, a/c, a flatscreen television, a PC connection, and high-speed internet access. I had the pleasure of staying in one of the Deluxe Double Rooms. My room was cozy and comfortable, with a lovely homey feeling. Plush furnishings and a comfortable bed with high quality white bed linens envelop you when you tuck in during the night. Beautiful details included parquet flooring, high ceilings, and a marble bathroom. My room had a large window overlooking the interior courtyard, where I enjoyed looking at the Bavarian architecture facing in. My room also had high speed internet and a television with multiple international channels. Those who follow me know I have a big thing for the toiletries offered by hotels, and is one of the first things I look for. I truly believe that the sign of a quality hotel is the provision of quality brands for its toiletries. So, I was very happy to walk into the bathroom to see luxurious Molton Brown products to enjoy! Inside the hotel is a Bar, Restaurant, and Garden to enjoy. Breakfast in the morning was a complete joy with a large spread of delicious food to choose from to start your day off right! The Palace restaurant features international cuisine and Bavarian specialties as well as the fantastic breakfast buffet and afternoon tea service. Head into the cozy Palace Bar to enjoy a cocktail, which is a popular meeting spot. The Palace Garden is a wonderful place to enjoy a drink, lunch, or dinner in this oasis in the middle of Munich. Feel like relaxing? Indulge in a pampering shower, sauna or steam bath, or get some exercise with the gym's quality equipment, all with access to the rooftop terrace. 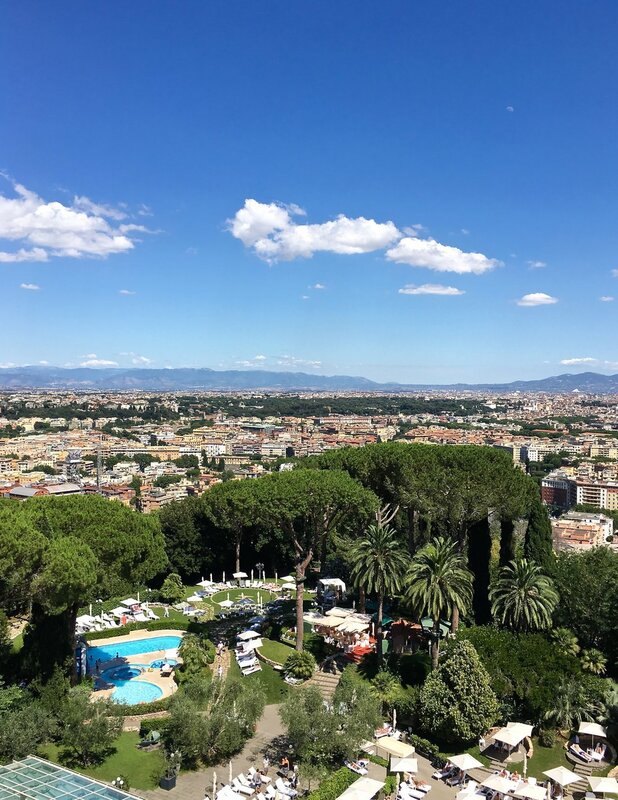 Even if you don't fancy working out, you can head up to the rooftop terrace to enjoy some beautiful views of the surrounding neighbourhood. The hotel also offers various event room facilities for conferences and private events, as well as business suites for meetings up to six people. Other services to enjoy from the hotel is a complimentary minibar, daily newspaper, bicycle rental, 24 hour room service, concierge services, garage parking, limousine service, and shoe shine services. Near the hotel, visit the sprawling Englischer Garten, or take in some culture at the Philharmonie and Opera, Villa Stuck Museum, or Prinzregententheater, or see the Friedensengel Monument. Getting into the city centre takes about 15 minutes, which you can access easily by public transport. The subway and bus (Museum line) stops are a few minutes walk from the Hotel, and the city's fairgrounds (Messe and ICM) are a 10 minute drive away. While my mum and aunt were recently visiting London from Canada and Spain, we celebrated my birthday a couple of weeks early by having afternoon tea at The Orangery at Kensington Palace. The setting is beautiful - the bright, white and airy room has large windows, soaring ceilings, and 18th century architecture, and is surrounded by the perfectly manicured gardens (you don't need to pay for admission to the palace to get to the Orangery). It is elegant, but not pretentious, so you can feel relaxed as you enjoy a traditional afternoon tea (or breakfast or lunch from their main menu), the only royal palace in London where you can do this. Adding to the magic of this setting is the The Orangery's history, which was once the place for Queen Anne's court entertainment. You can choose from the 'English Orangery Afternoon Tea' or the 'Royal Afternoon Tea'; the difference between the two is that the Royal tea comes with a glass of bubbles (Laurent-Perrier Brut NV or Merlot Rosé Spumante NV) or a glass of the quintessentially English drink, Pimms. There is a nice selection of sandwiches served, which include a very tasty coronation chicken, roast ham and English mustard, cucumber and fresh mint, egg mayo and cress, and smoked salmon and cream cheese. Light and tasty, these sandwiches were a great way to start the tea. I just wish that there was the opportunity to have them refilled as you are often offered in other settings. Next came the scones, which are orange-scented and currant, served with classic Cornish clotted cream and English strawberry jam. The scones were light and delicious, and importantly didn't fill you up too much before you got to the cakes (which often happens to me). The tea pastries and cakes were also fairly light to finish off the tea, including a tasty Victoria Sponge. Important to me was that they weren't too sickly sweet or rich to enjoy. There is a range of loose teas, tisanes, or coffees to choose from. For teas, you can choose from a range of black or green teas, or herbal and fruit infusions. Vegetarian options and an afternoon tea made from gluten free ingredients are available upon request. There is also a children's afternoon tea available on request for £11.50 per child. The English Orangery Afternoon Tea is £27.50 per person. The Royal Afternoon Tea ranges from £33.50 to £37.50 depending on which drink you choose. Afternoon tea is served between 12.00 - 18.00. I highly recommend making a booking in advance because it is often very busy, particularly on weekends. They do accept walk-ins; however, be prepared to potentially wait in a queue for quite a long time. After leaving The Orangery, be sure to take a look at the new White Garden nearby in the historic Sunken Garden at the Palace for Spring and Summer 2017. 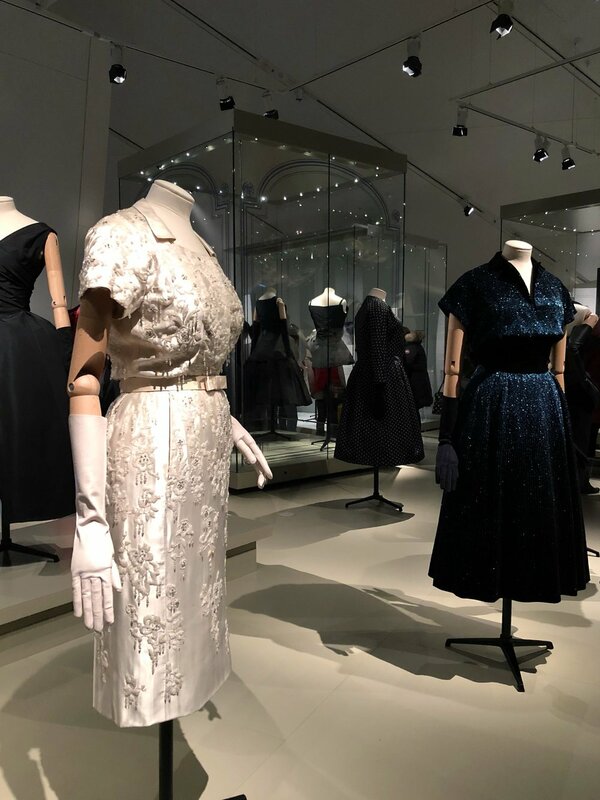 The Garden has been created in memory of Princess Diana, inspired by her life, image and style, and complements the current exhibition, Diana: Her Fashion Story. The garden is awash with beautiful tulips, narcisii, forget-me-nots, white English roses, Cosmos daisies, Gaura, and ornamental grasses. It is absolutely beautiful so take a walk around the entire square to see all angles of this thoughtful and stunning garden.